Nice change compared to my last few arrivals in Frankfurt in that we arrived at the “top” of the Z gates so it was a very short walk to immigration and the transfer gates. 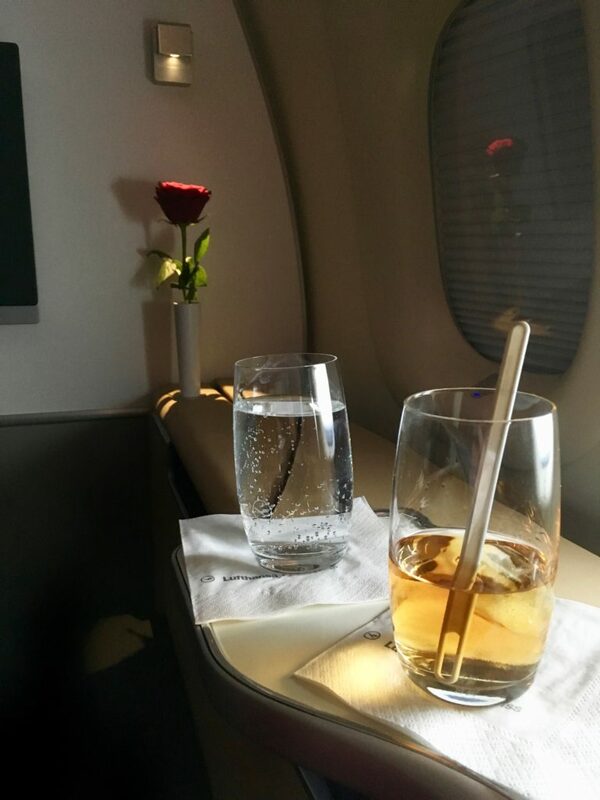 No real NEED to go through immigration except one: I had about three hours, and wanted to get some Starbucks and go to the First Class Terminal. As one does. No silly first class lounge at the B gates for me with the risk I wouldn’t get a ride to the plane! Only one problem today: immigration lines were rather long. Managed to talk my way through one of the shorter lines, and was through quickly enough and I made a beeline for caffeine. 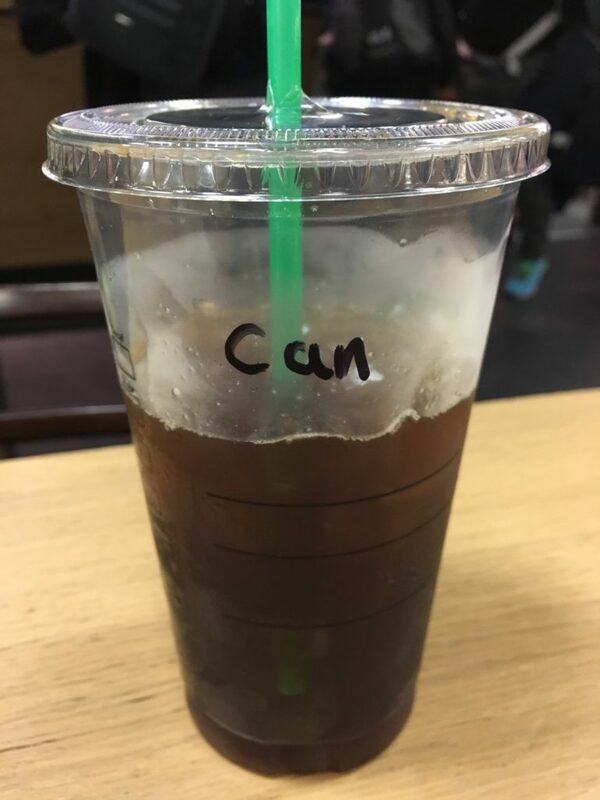 I have no idea who “Can” is, but it doesn’t sound remotely like Jason and I think I got his coffee…. For some reason, I’m always burning up after a redeye flight, so the chilly walk to the First Class Terminal felt great. Fantastic agent at check in, and unfortunately I got selected for random extra screening by security. Normally, this would be a pain but at the First Class Terminal they’re almost apologetic about it. 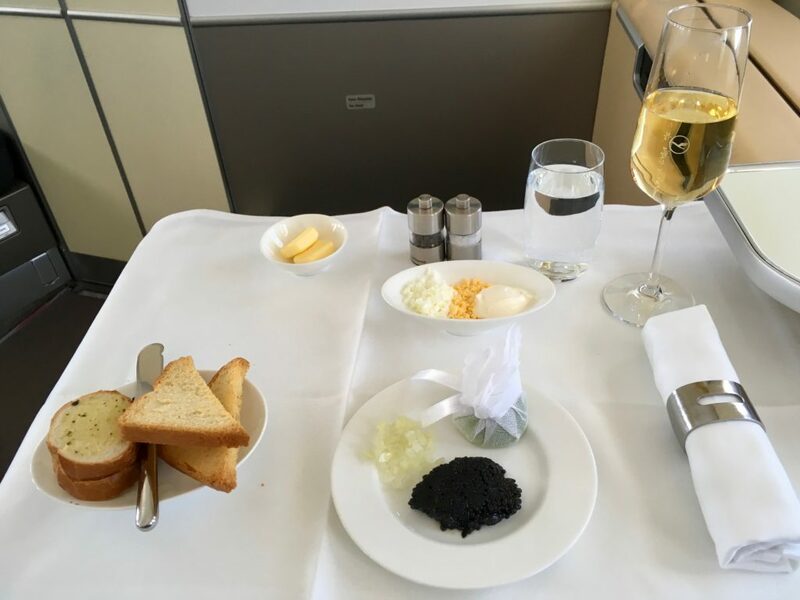 Since I’d skipped breakfast on the plane it was time for a proper breakfast before grabbing a shower. 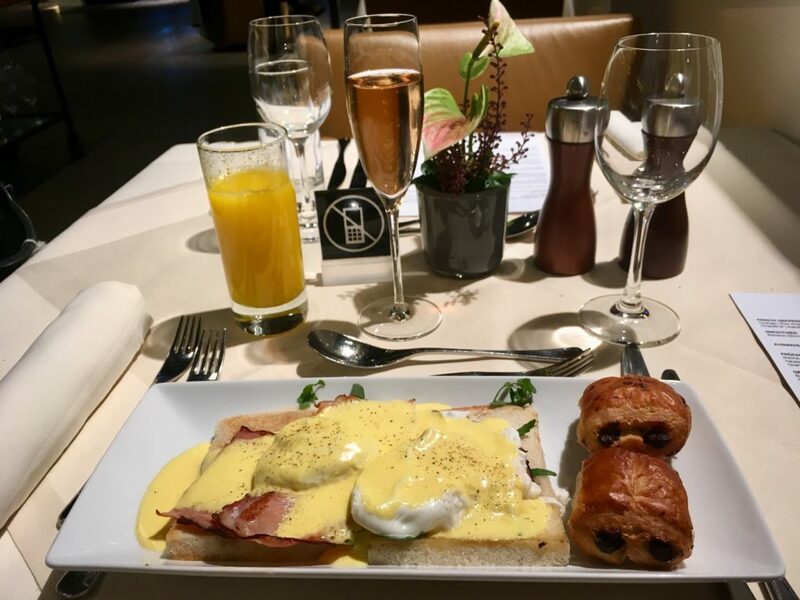 Eggs Benedict, Pain au Chocolate, fresh-squeezed OJ and some rosé? Don’t mind if I do! 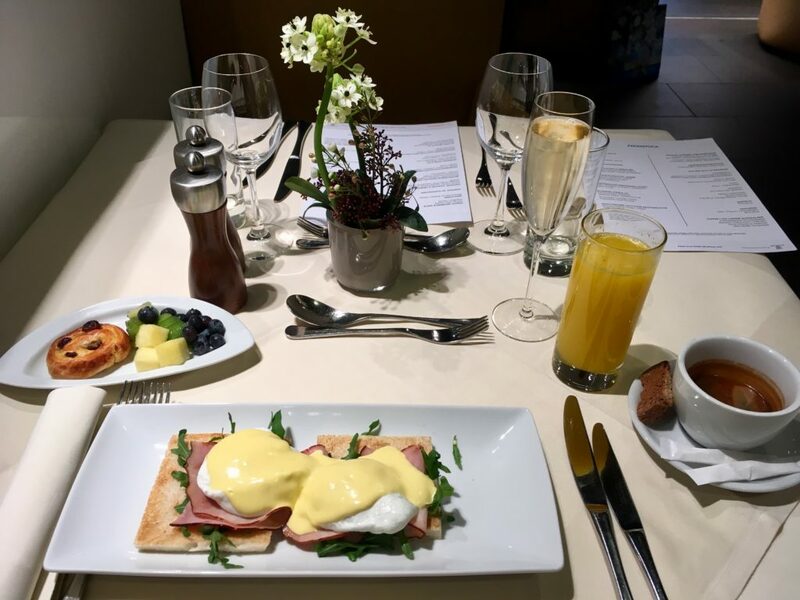 My only small quibble with the lounge (other than the temperature, but that’s a German thing) is that they stopped carrying english muffins some time in the last 6 months and now serve the benedict on toast. Oh well, I’ll live. Since it’s happened several times in a row now I assume it’s the new normal. 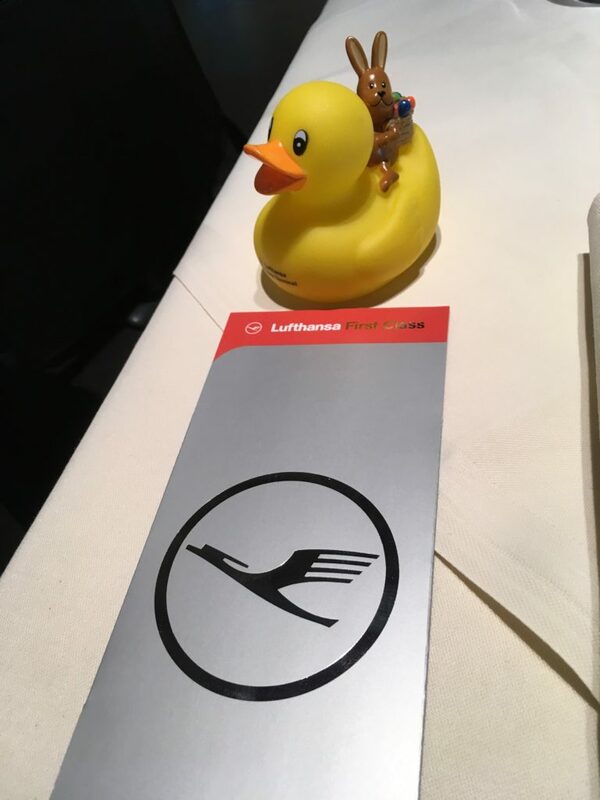 Nice shower, grabbed a few ducks (anyone interested in trading some Lufthansa ducks let me know), and soon enough it was time to board my flight to Munich. 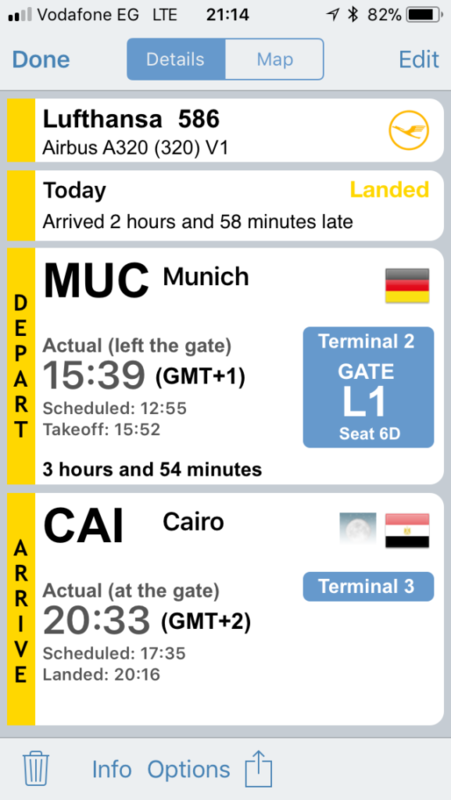 I didn’t expect that anyone else in the lounge would be going to Munich, but surprisingly I was one of four people! 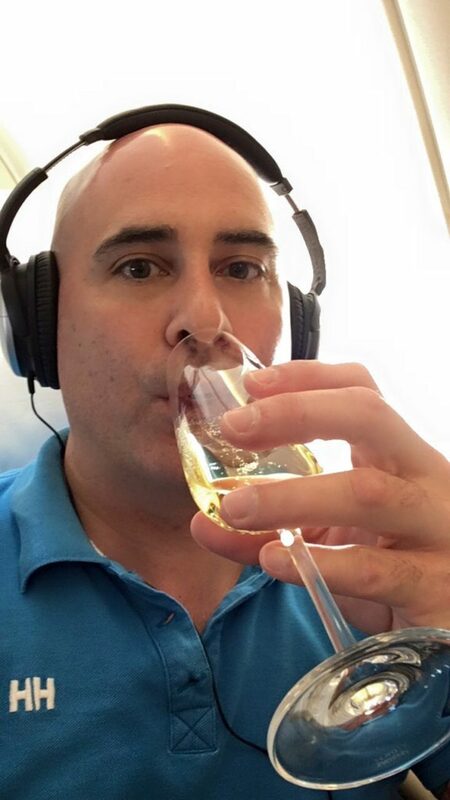 I guess either there were lots of HON Circle members headed to Munich today, or others with first class connections out of Munich? Today’s flight time? 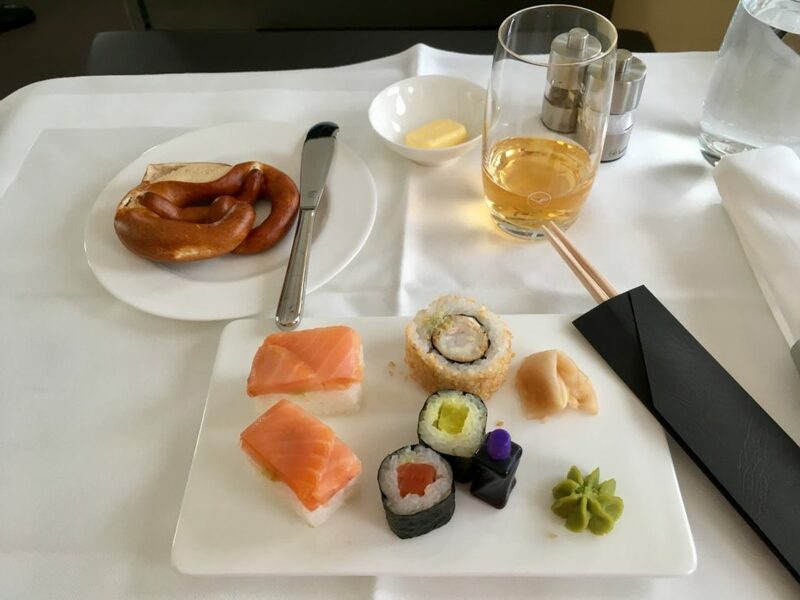 a whopping 37 minutes in the air….but that doesn’t stop Lufthansa from serving a nice deli plate and making TWO drink runs. 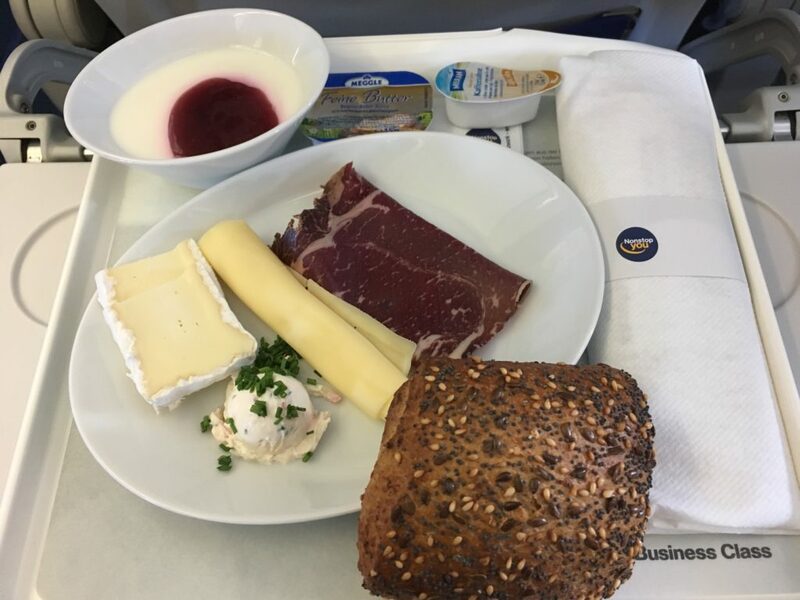 Also, a first for me on a Lufthansa A321, there were 15 rows of business class today! 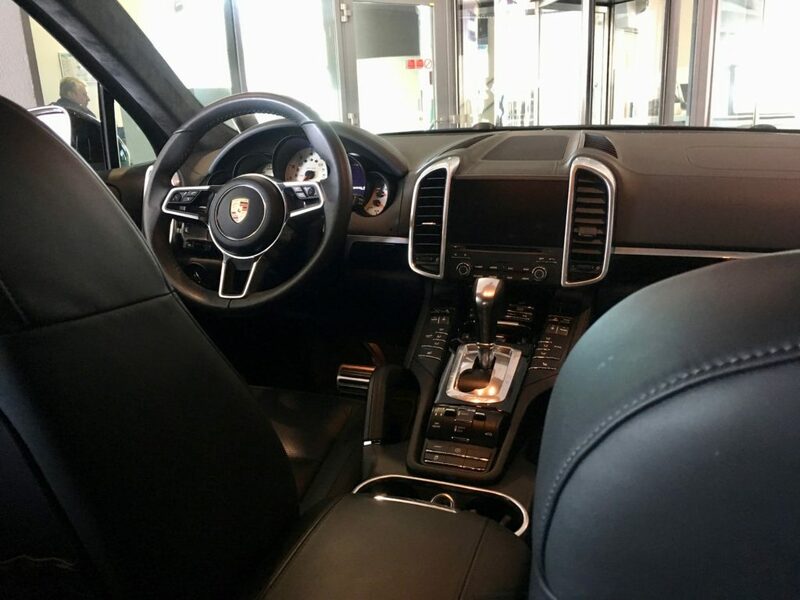 As most people know, this is “EuroBusiness” which is just standard economy seats with the middle blocked. 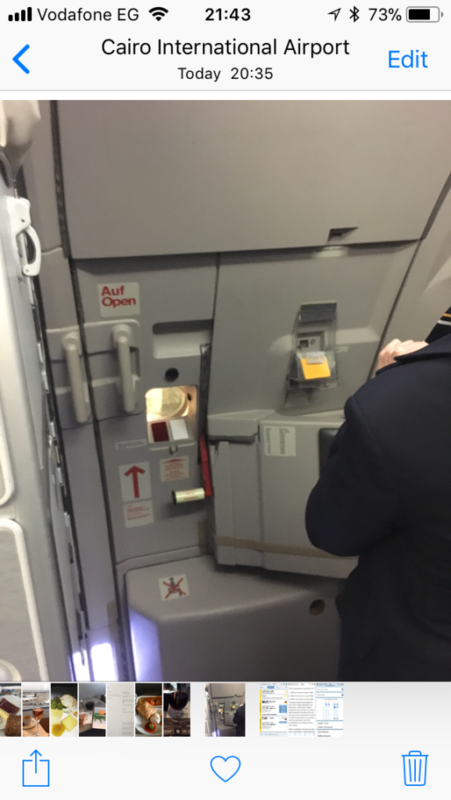 This means they can easily move the divider between cabins….and today there were 58 seats in business! Relatively short connection in Munich of barely 90 minutes, but one of the best things about the First Class Lounge in Munich is that when you enter there’s an immigration desk, and they take care of immigration while you enjoy the lounge…and then you collect your passport on the way out and re-enter the correct part of the terminal: Schengen or not. Down to the gate, and boarding was right on time. Unfortunately, departure time came and went and after 10 minutes the captain came on. Apparently we had some sort of mechanical issue, and the mechanics would be coming on to check it. They showed up a little bit later, checked some things out, and as they left the plane the only word I could make out to the flight attendants was “Kaput!” That’s not a good sign. Sure enough, the pilot announced that this plane was going nowhere today, and please wait while they figure out what’s going on. Turns out, there was another plane sitting around which they hoped to have catered and ready to depart in about an hour. Please collect your bags, head back to the terminal, and we’ll let you know what’s up. After about 15 minutes of milling in the gate area they told us where our new gate would be, and that boarding would hopefully begin in 30-40 minutes. So yes, back to the lounge where the agents were already aware of the issue, and said they would come get me when it was time to board. 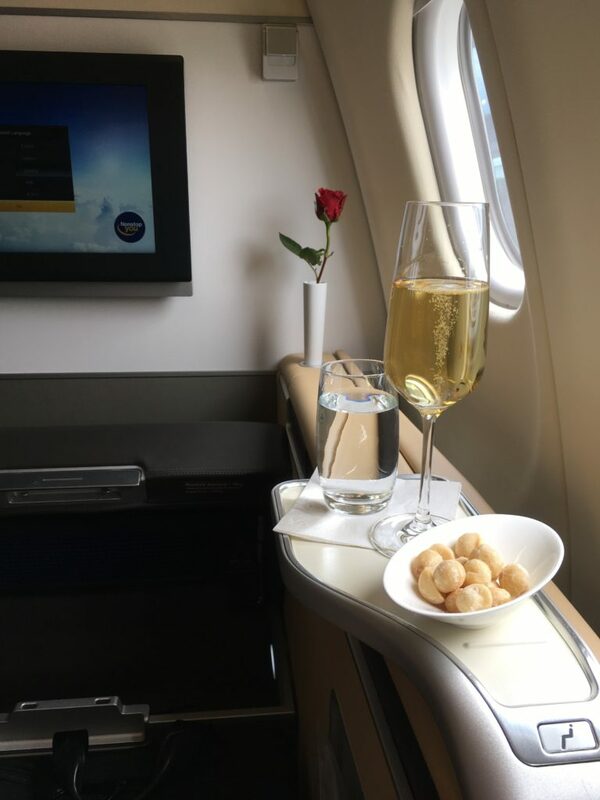 Yes, that meant time for another espresso and glass of champagne. The struggle is definitely real. After about 20 minutes they told me boarding was ready to begin, but when I got to the gate it took about 20 more minutes for us to start boarding. 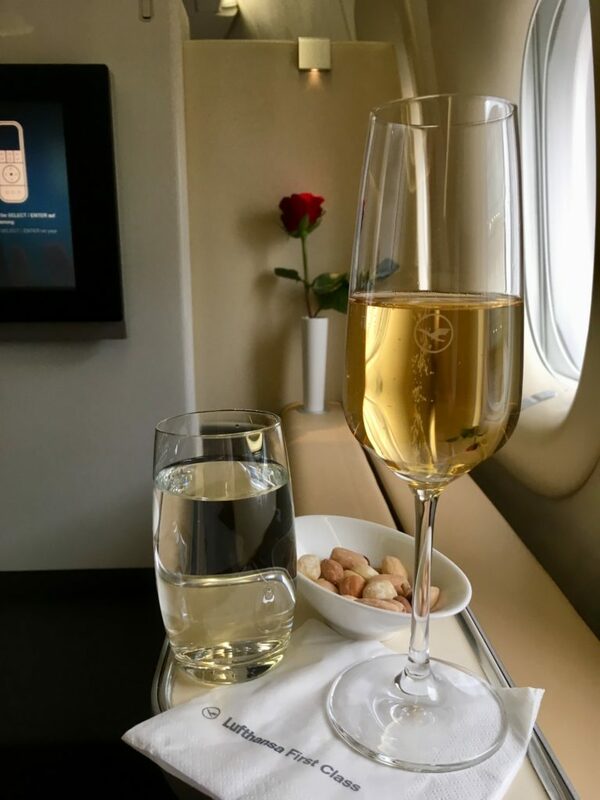 We finally ended up pushing back about two hours and 44 minutes late…so it was beginning to look like I was just going to miss out on the 300 euros mandatory compensation under EU Regulation 261. Boo! If I’m going to be 2:44 late I can take another 16 minutes! Fortunately, I was the only person in my section of seats, so I had a whole row to myself. 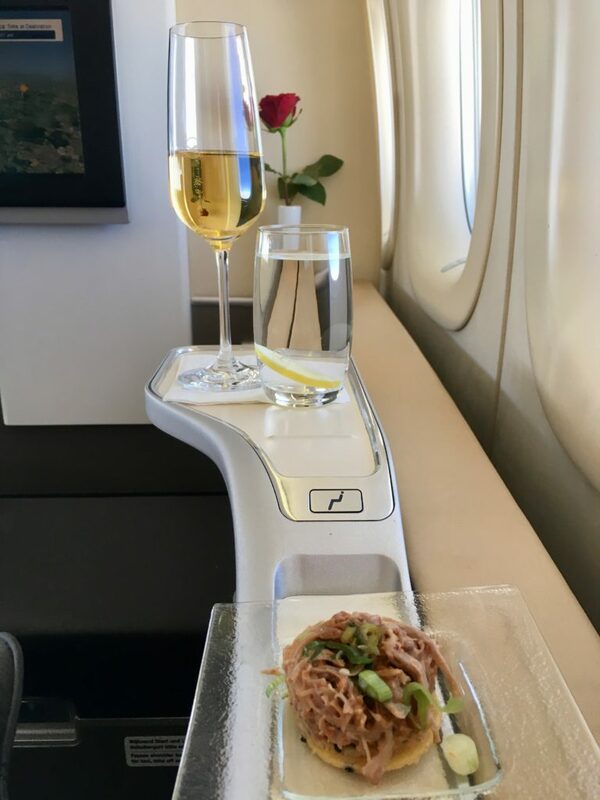 This meant I could use one of the fold-out tables from the bulkhead just for food and drink and another for watching films on the iPad. 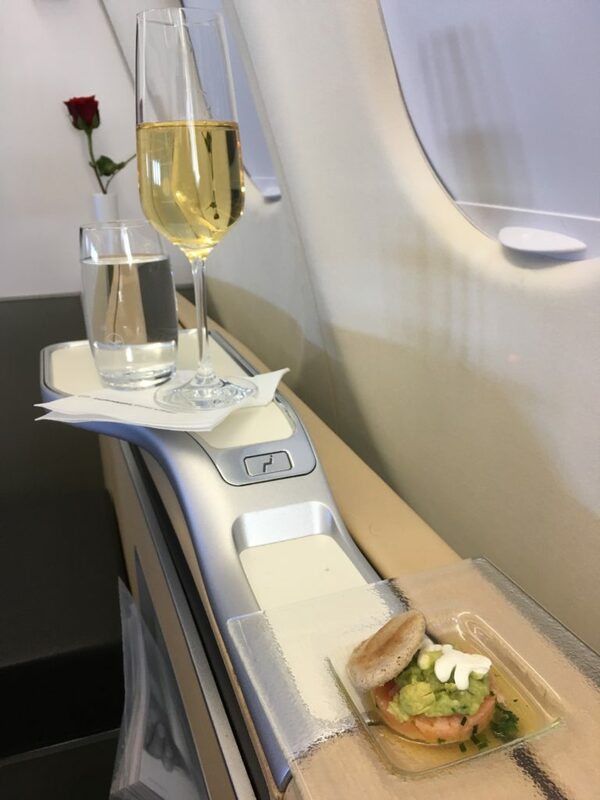 Not a bad way to fly on a narrowbody. Then it moved on to a full lunch. 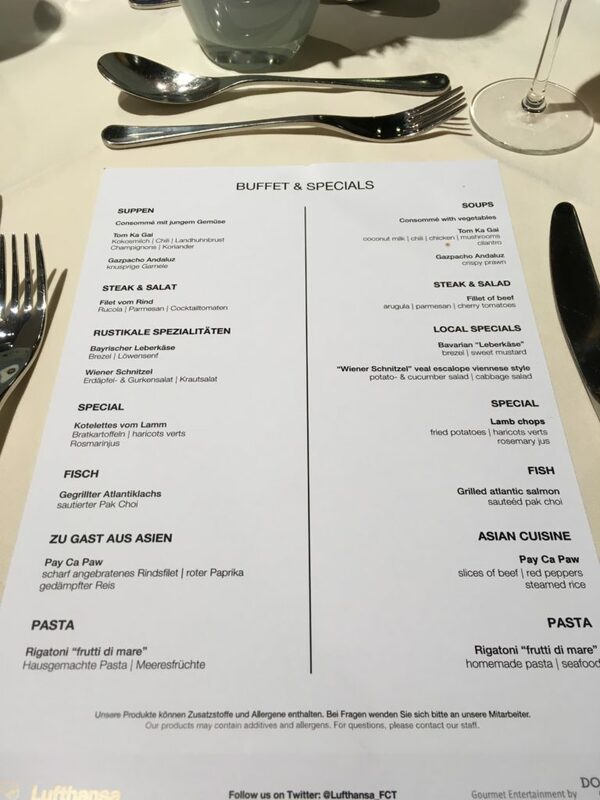 The burrata and plum tomatoes with pesto were fantastic, and there were three choices of main: veal goulash, halibut, or canneloni I went with the goulash which was much better than expected…and the “cocoa bean cream on mango cubes” was fantastic for desert. 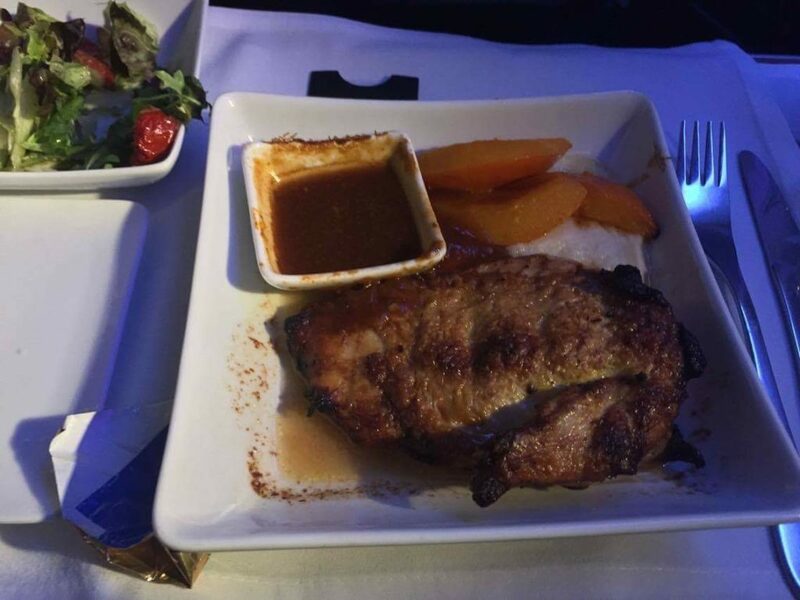 Fantastic meal for a shorthaul. 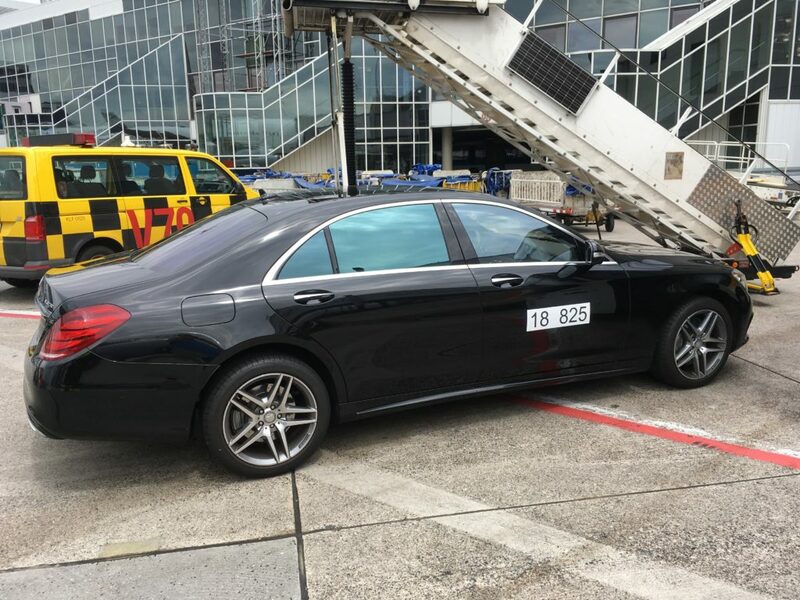 We landed 2:43 minutes late, so unless this taxi took 17+ minutes it looked like I was going to miss out on 300 euros by mere minutes. Not sure if anyone else has heard the expression “BFE” which stands for “Bumf*ck Egypt” implying somewhere is in the middle of nowhere…but that’s definitely where we landed today. The taxi went on and on, as the minutes ticket closer and closer. 2 hours and 59 minutes late, we finally parked….and the flight attendant was ready to open the door. For the first time ever for me, there was absolutely no wait at all for immigration or a visa, so I handed over my $25 at the bank, got a visa sticker, quickly through immigration, and maybe 15 minutes after arriving I was at the Le Meridien checking in. Dropped my bags in the room, and headed down to the sports bar for a quick drink before turning in for the night. Unfortunately, however, it was Thursday night and half of Cairo was at the sports bar drinking and smoking up a storm. 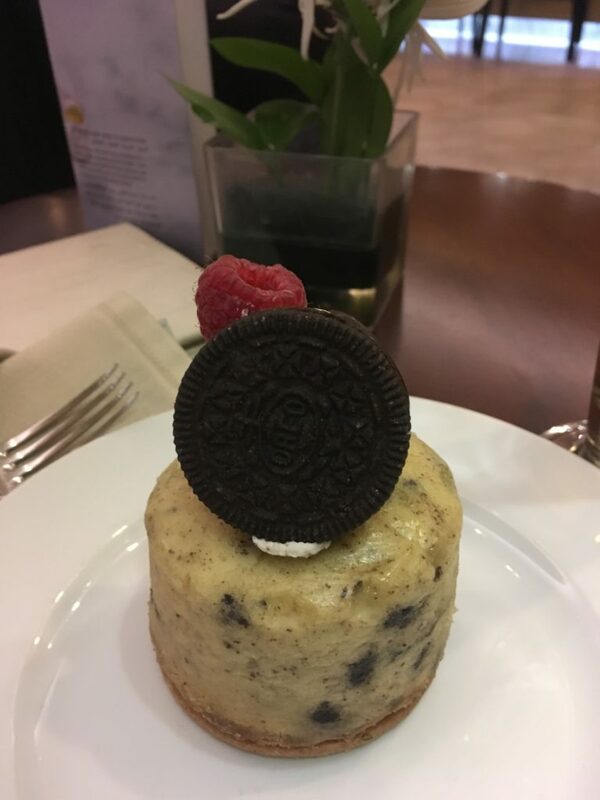 My lungs couldn’t take it, so I headed up to the relatively empty lobby bar for some cheesecake and a glass of bad Egyptian wine before turning in. With that done it was time to get some sleep before taking care of a few things in the morning and then turning right back around to head to Germany to begin the real vacation portion of the trip! So, a lot of this post is likely going to seem a bit familiar since I did this exact same route just four weeks prior. 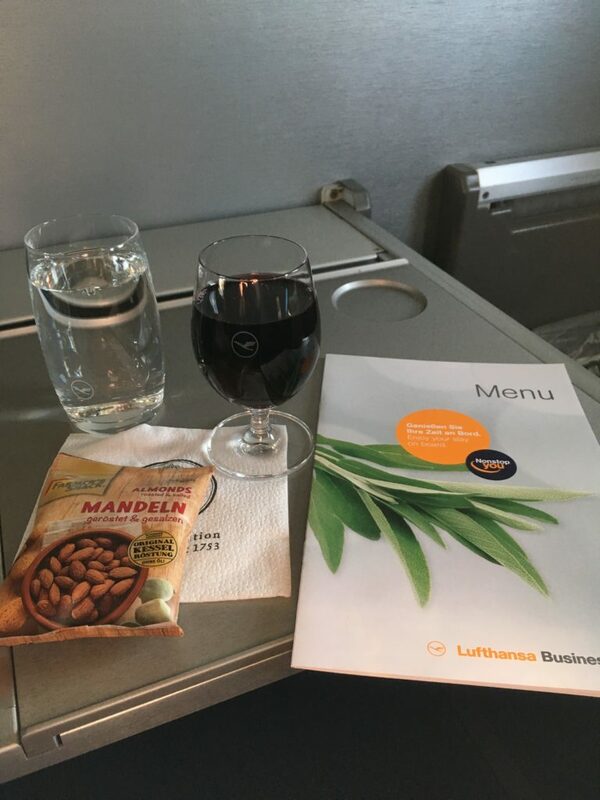 That trip, however, wasn’t the best Lufthansa First has to offer (at least in the air) although it was still a great trip. 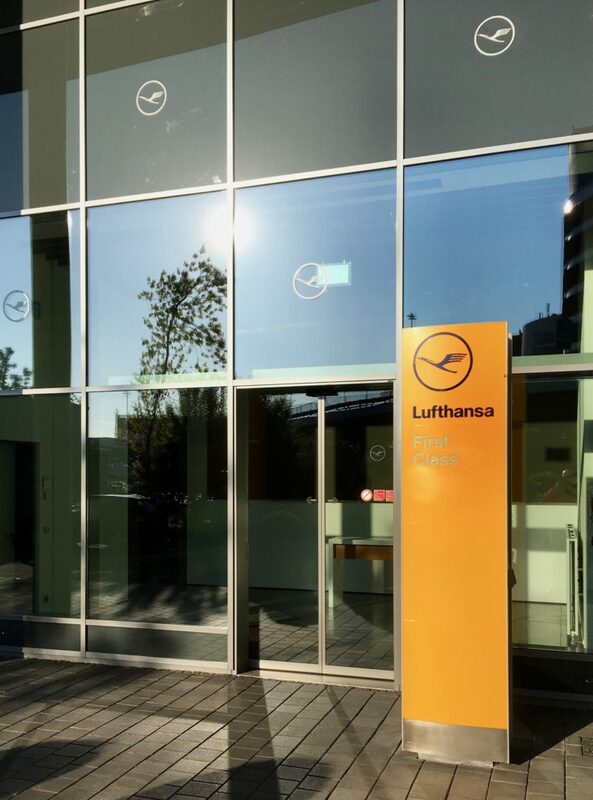 I was curious to see how this one would compare…and would it satisfy my craving for Lufthansa First for a while. Took the lift up, quick check-in and when the agent saw my name he seemed to have a flicker of recognition. He still asked if I’d ever been to the terminal before, and when I said yes he escorted me through security, told me to make myself comfortable, and he would be right back. 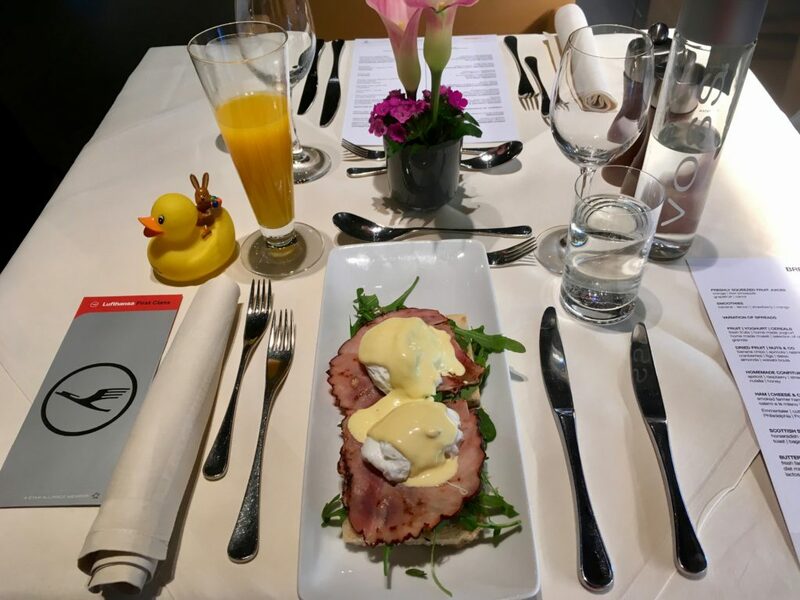 I was pretty hungry by this point, so I joined the duck for a breakfast of fresh-squeezed orange juice and some eggs benedict…which was delicious. 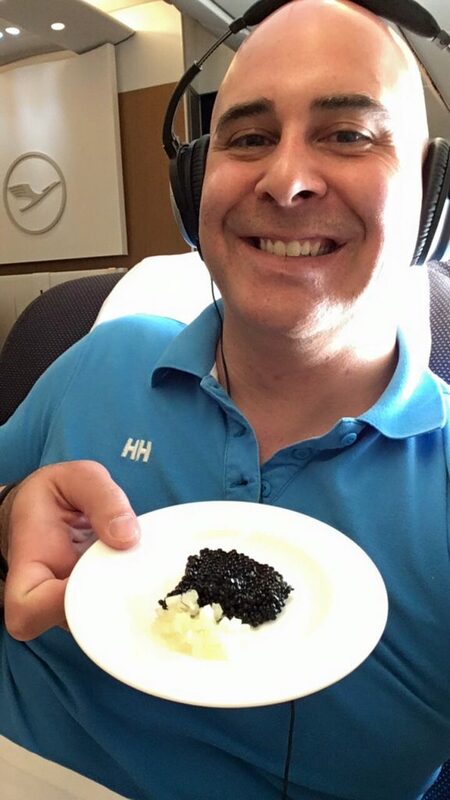 Not just “airport good” but honestly one of the best eggs benedict that I’ve had anywhere in the world. 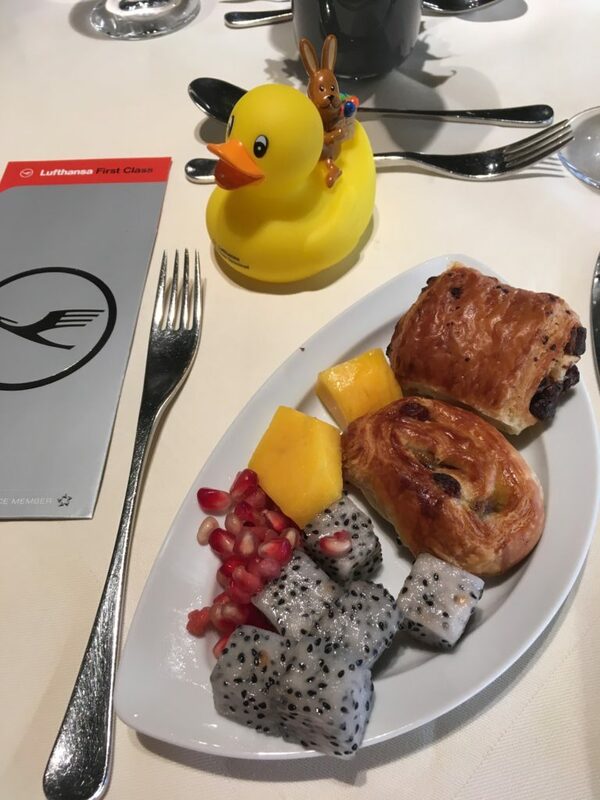 Still not quite full, I decided to be healthy with some of their more “exotic” fruits on the buffet, and had some dragonfruit, mango, and pomegranate…which I promptly offset with a couple of viennoiseries…. 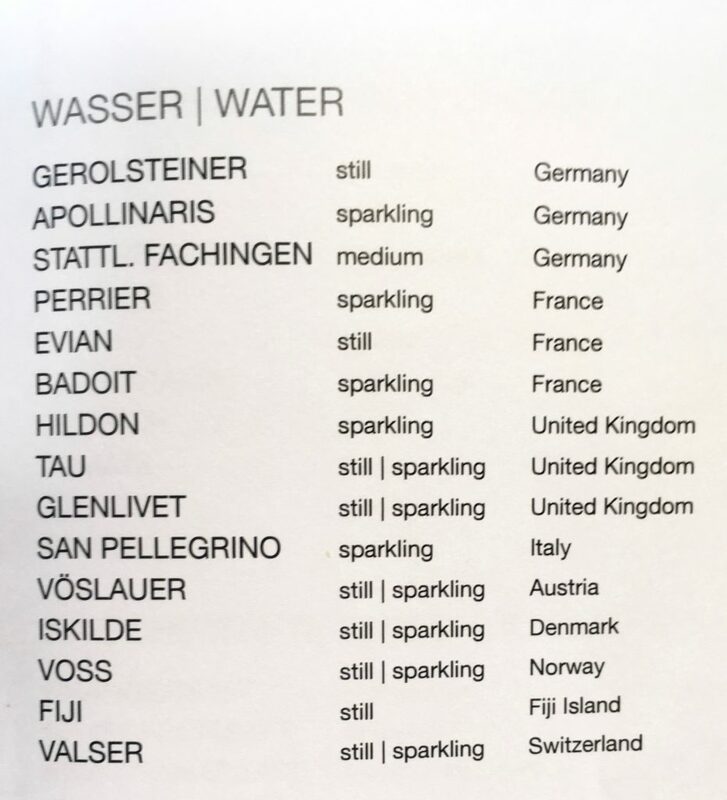 I was offered more water, and while Voss may be good enough for Madonna, I requested some Valser still this time. Why? 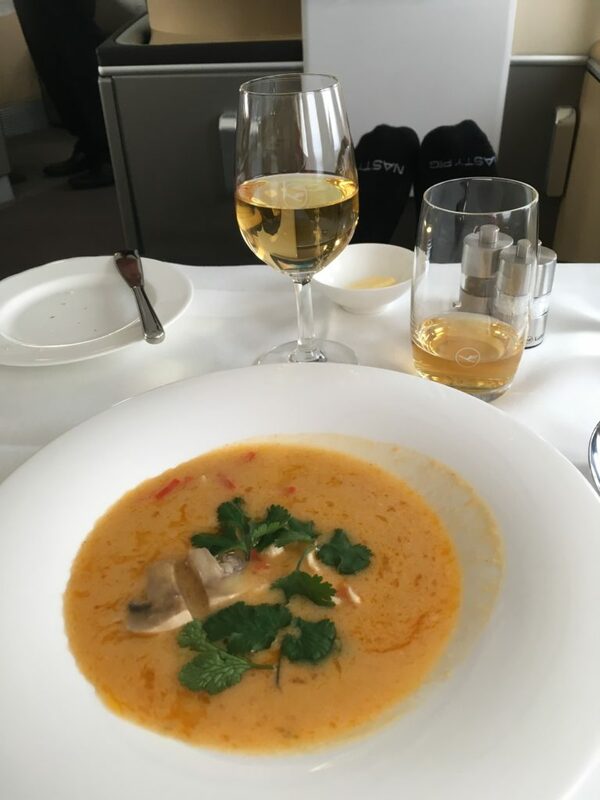 Because with the First Class Terminal’s water menu…that’s your prerogative! 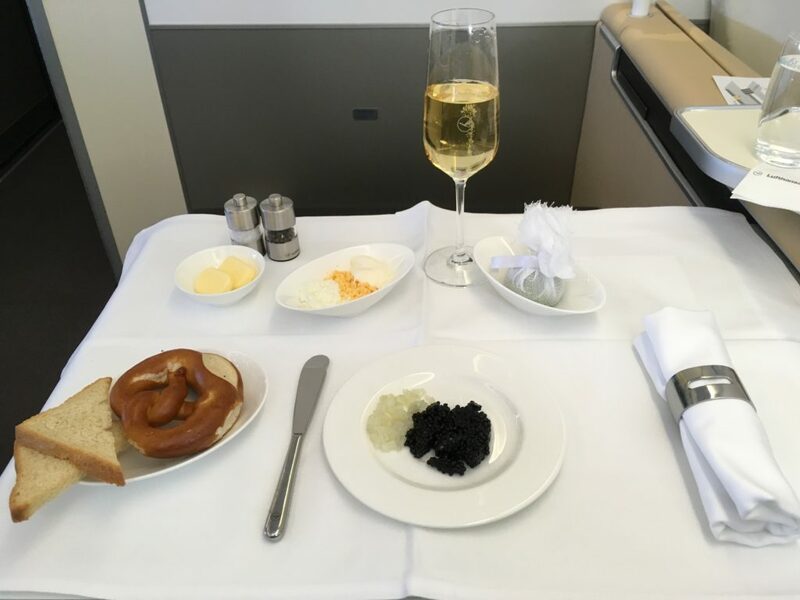 Upon boarding champagne was quickly offered, and perfection awaited. Special treat today: 1998 Henriot Cuvée des Enchanteleurs. 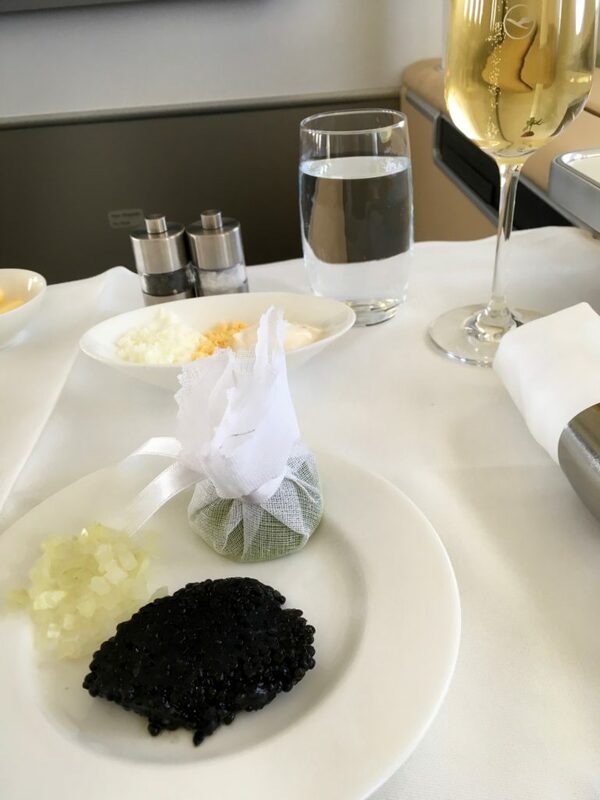 Don’t get me wrong, I love airlines that pour Krug and Dom, but there’s something extra thoughtful about pouring a slightly more obscure high end champagne. 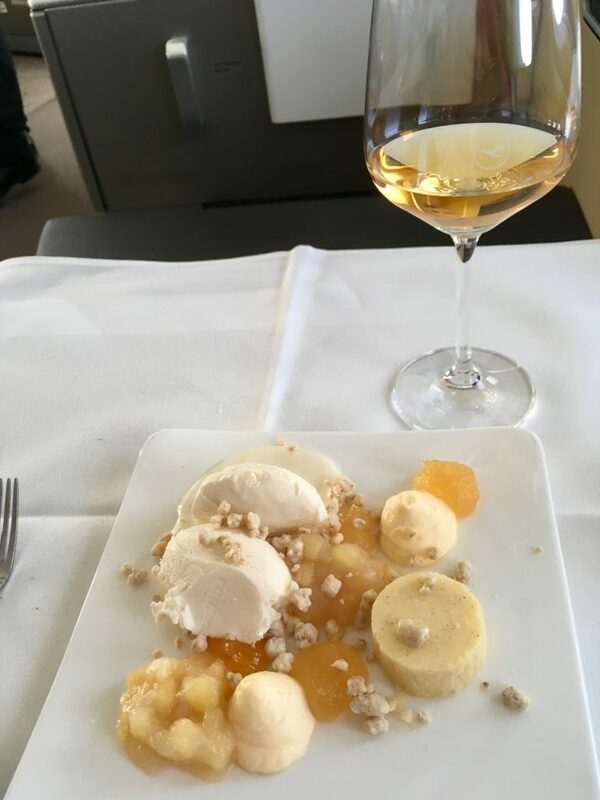 The Sir Winston Churchill on Asiana was memorable, and this Henriot was also a delicious surprise. 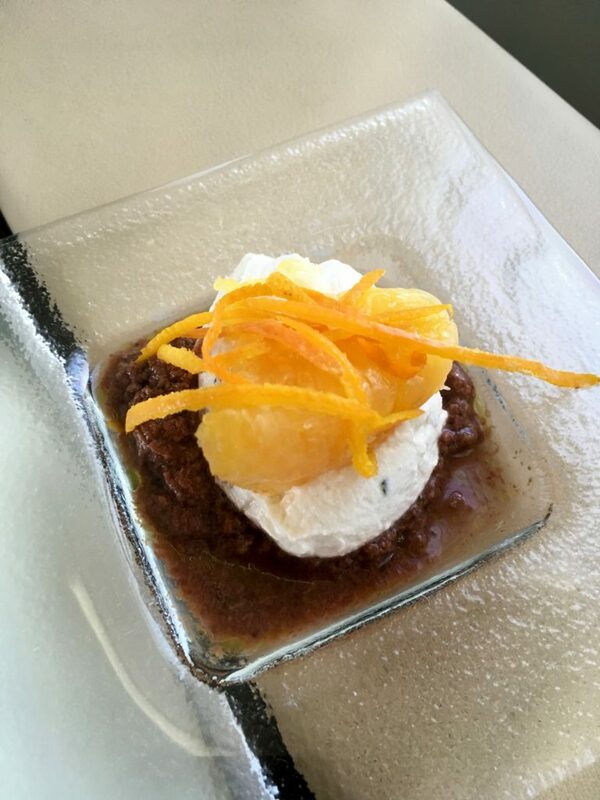 Pre-departure amuse bouche of chevre with mandarin…and if I remember right a roasted red pepper sauce. 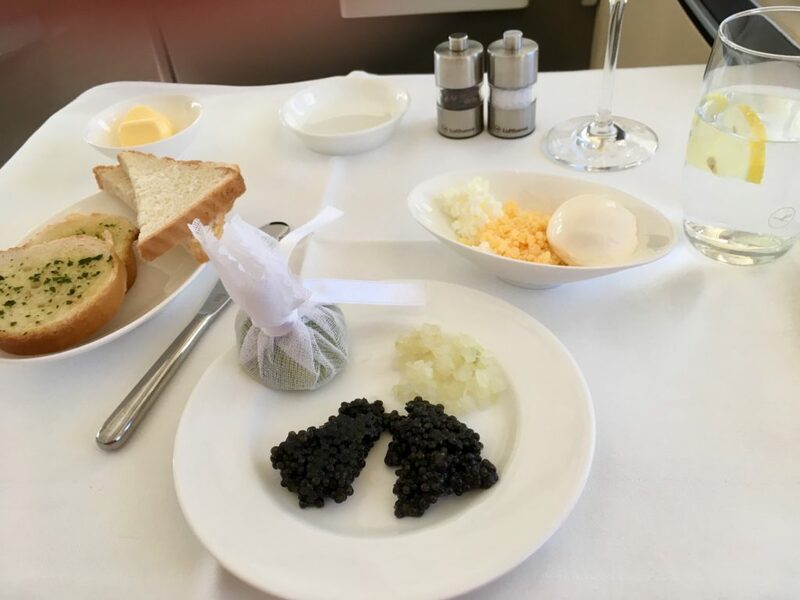 …they made sure to offer an extra-generous portion of caviar today. 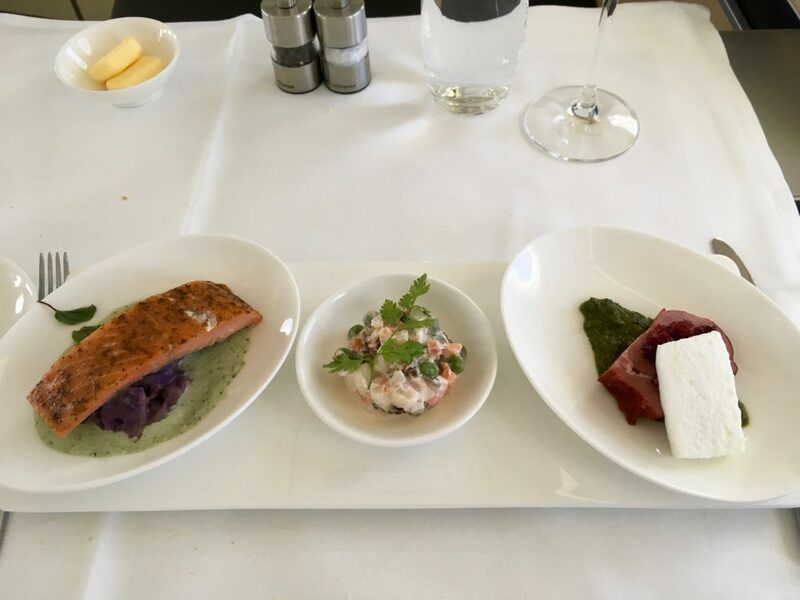 Trio of starters: marinated tenderloin of veal with lingonberries, smoked rainbow trout with purple potato salad, and leipziger allelei vegetable salad. 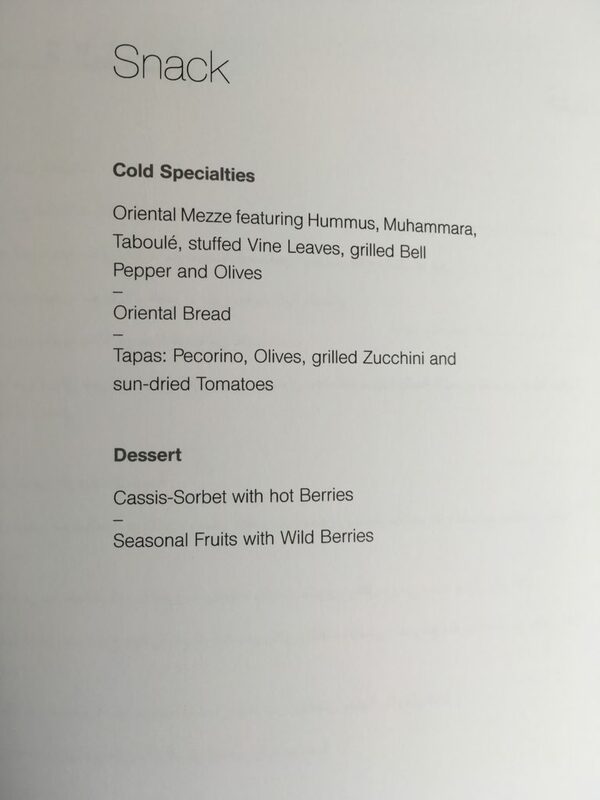 The salad was underwhelming, but the other two were fantastic. 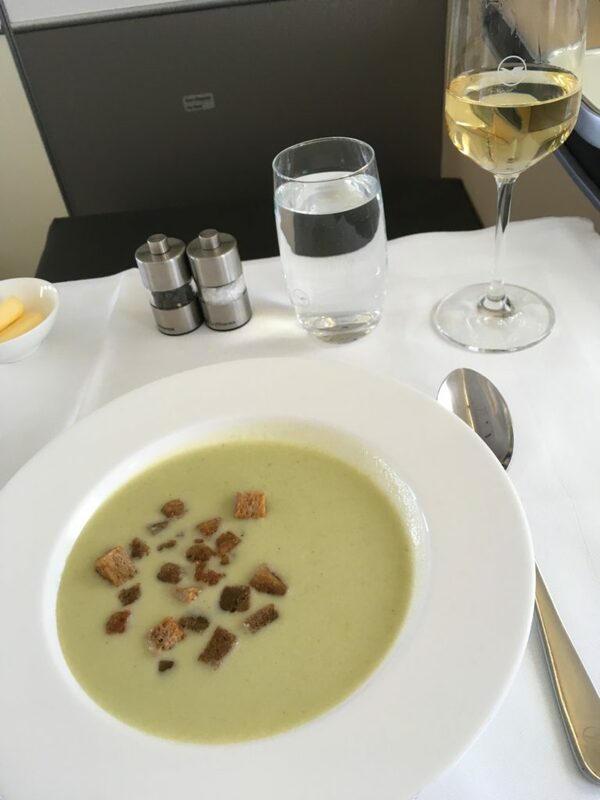 Spring onion soup with parmesan cheese and croutons – surprisingly flavourful and tasty! 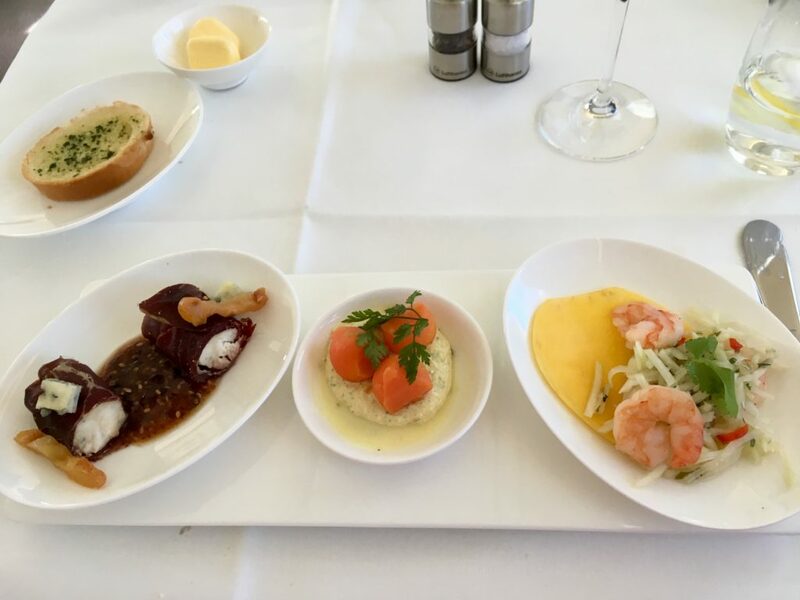 Time for the main event – decided to go with the fish option today, and the “monkfish in pommery mustard sauce with ginger cucumber and parsley potatoes” was absolutely amazing. 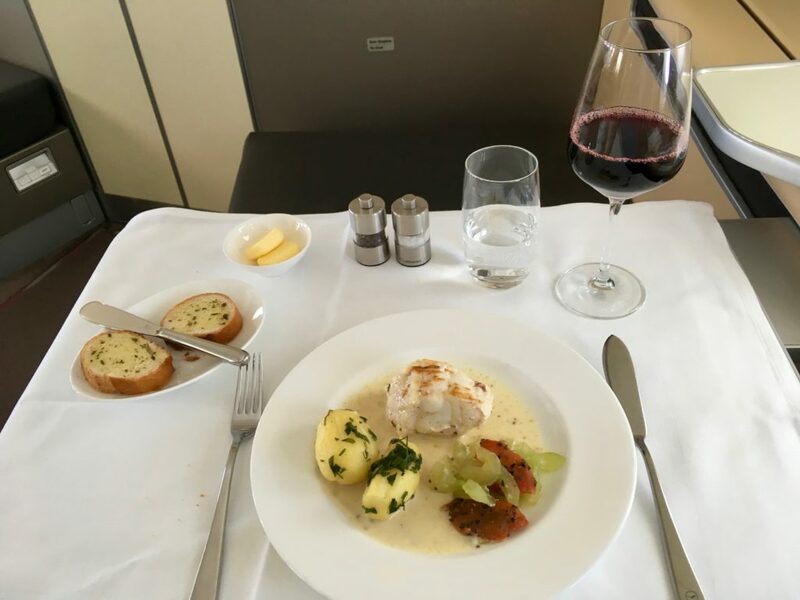 I could have done without the potatoes, but the monkfish was delicious. 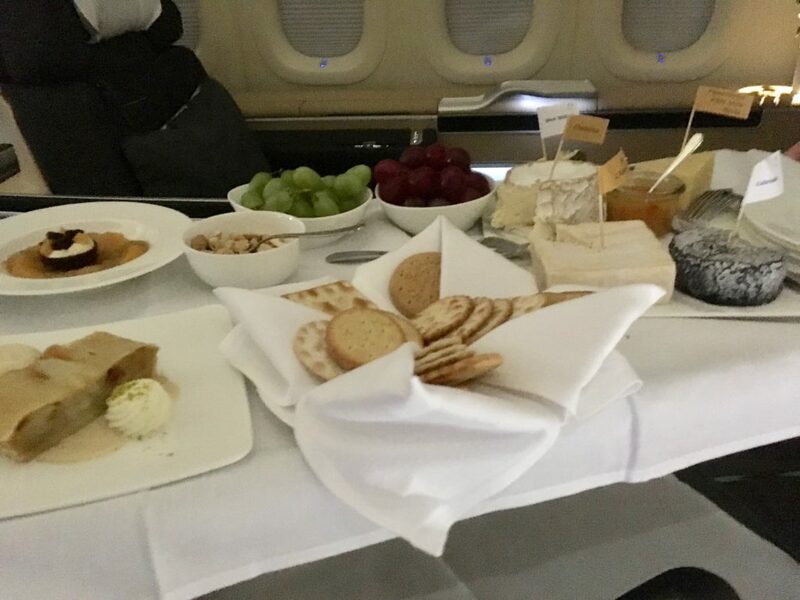 Here comes the cheese and dessert cart. 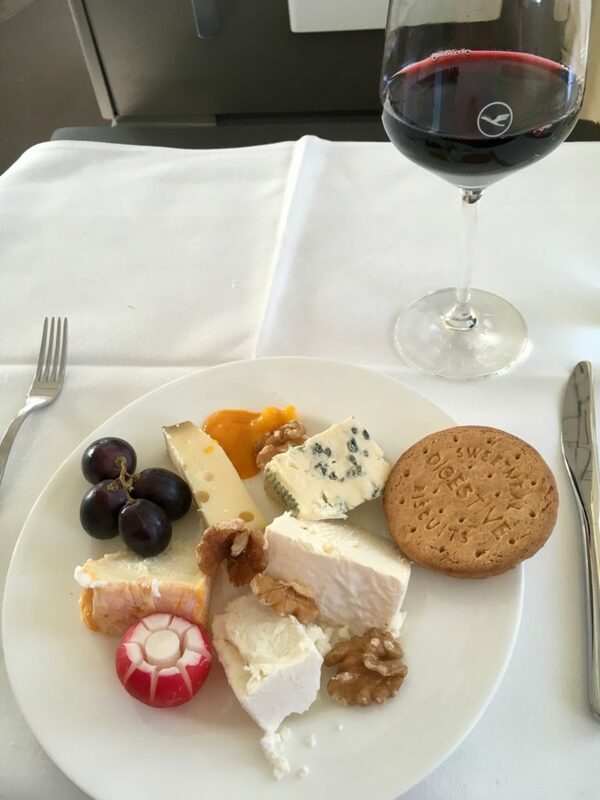 I don’t think anyone does cheese like Lufthansa. Nice selection, with some sweet biscuits. Fantastic. 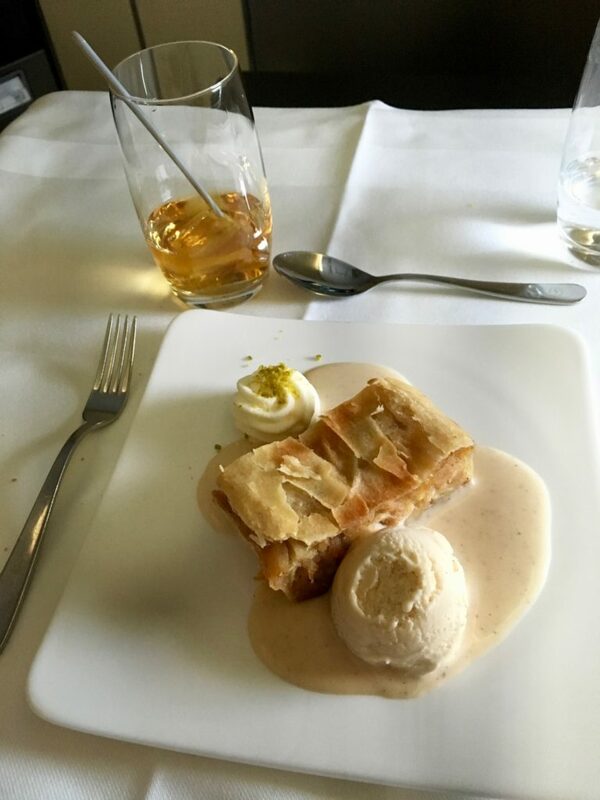 How could I resist finishing with an apple strudel and some Johnny Walker Blue? Somehow, I wasn’t tired after all this food, so opted for a double espresso and a couple of movies. 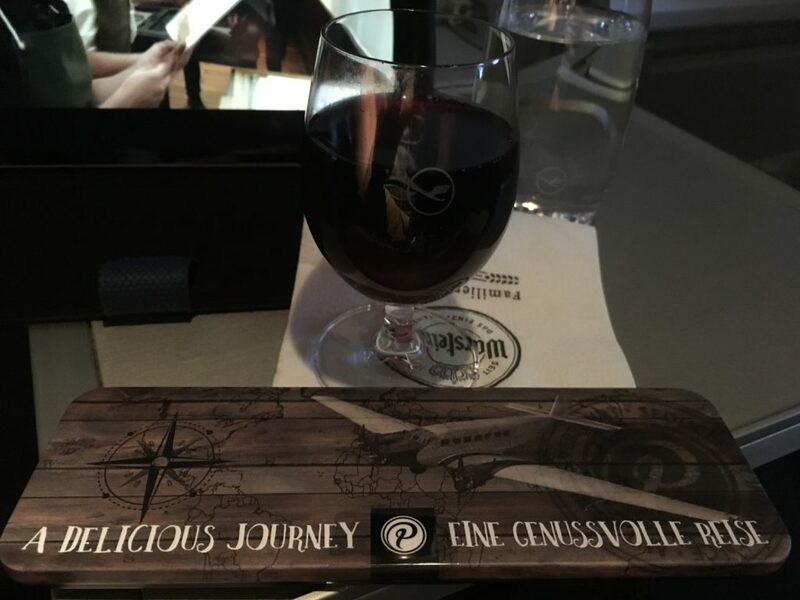 After about five hours of movies, it was time for a pre-landing snack. I was recommended the seafood soup with crawfish tails and chilis and the Spanish meat and cheese plate. 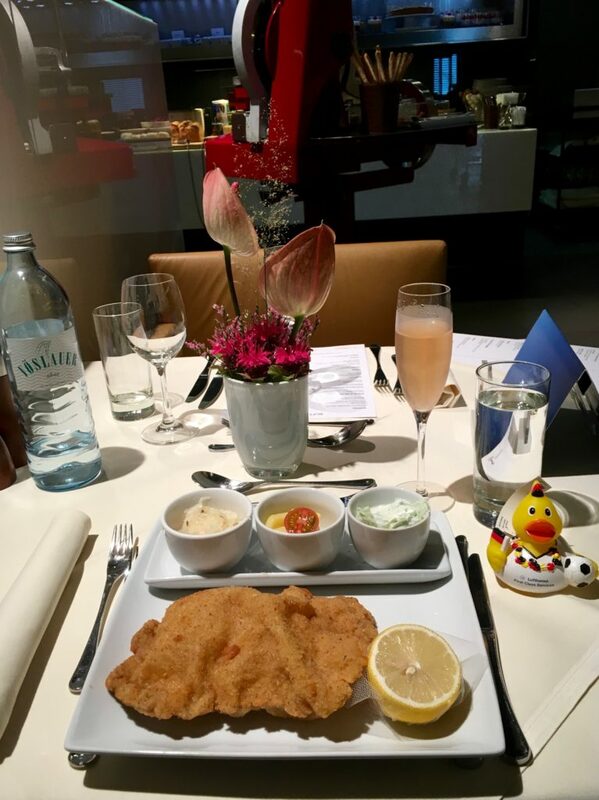 Went great with another glass of the delicious Henriot and some pretzel bread. 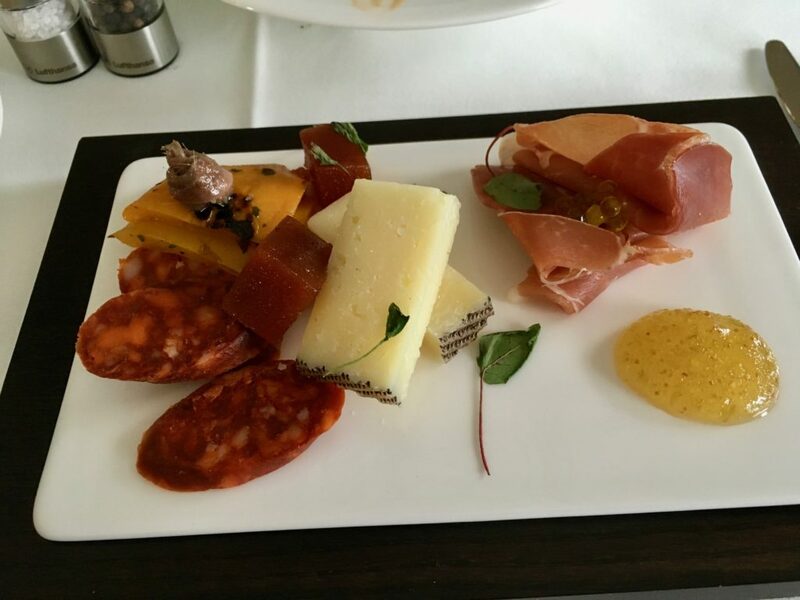 Quince jelly and my favourite – manchego cheese. Yum. 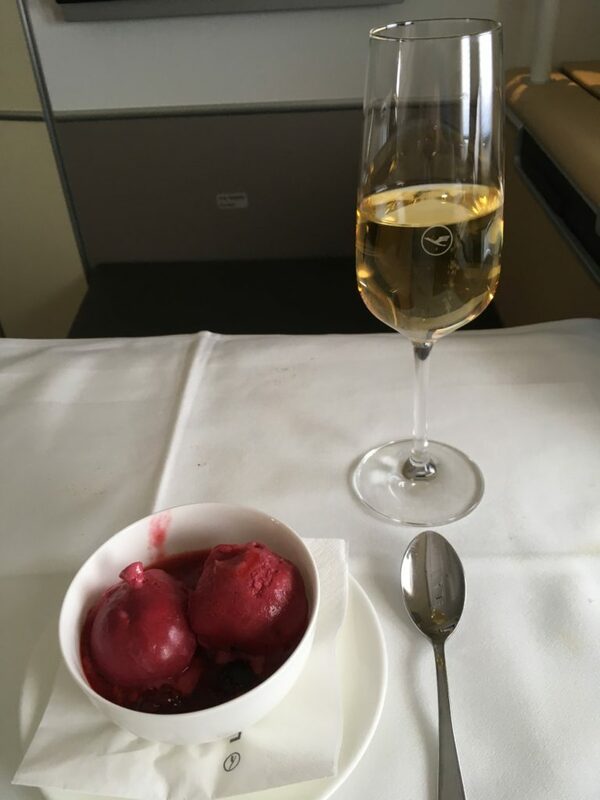 A couple of scoops of cassis sorbet and another glass of Henriot to finish off an absolutely delightful flight. 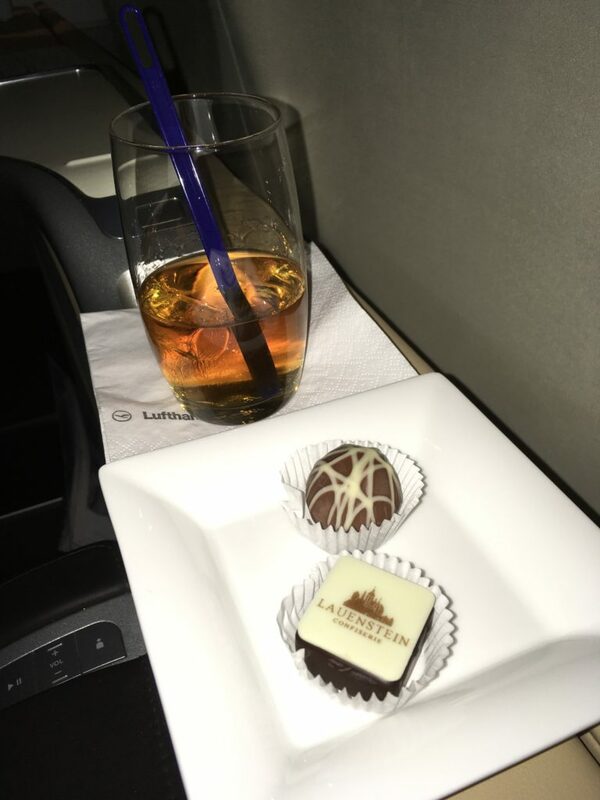 They wouldn’t let me finish without a couple of chocolates for the road. Immigration and customs were a non-event in Chicago with Global Entry, and I was off to Starbucks to try and wake myself up. 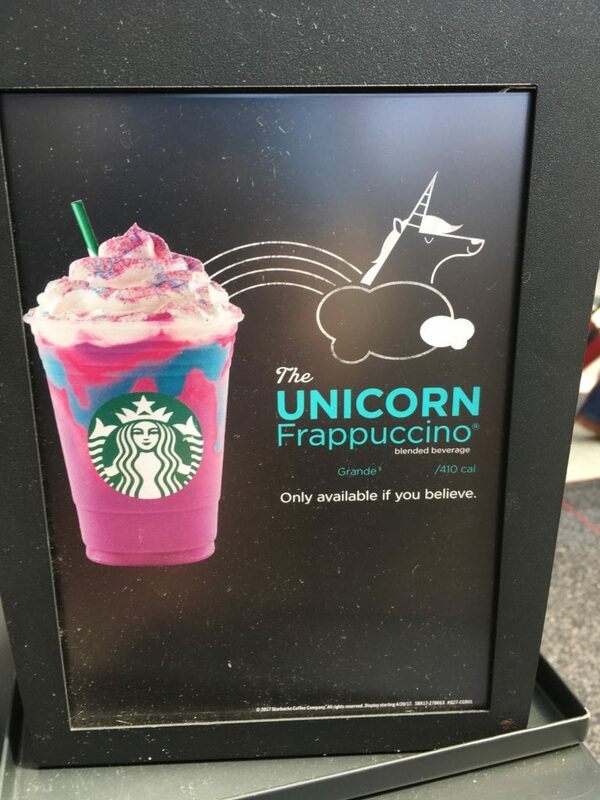 Seriously America, I leave you alone for a week and you come up with Unicorn Frappucinos? I weep for the future. 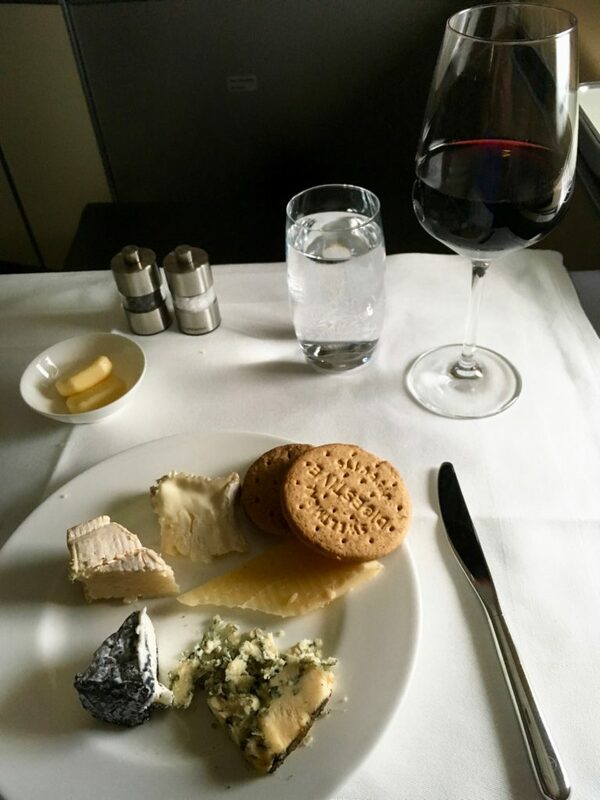 I stopped by the United Club. I don’t know why. It was depressing. Hot, crowded, and felt like a high school cafeteria. I think I might have lasted five minutes before leaving. 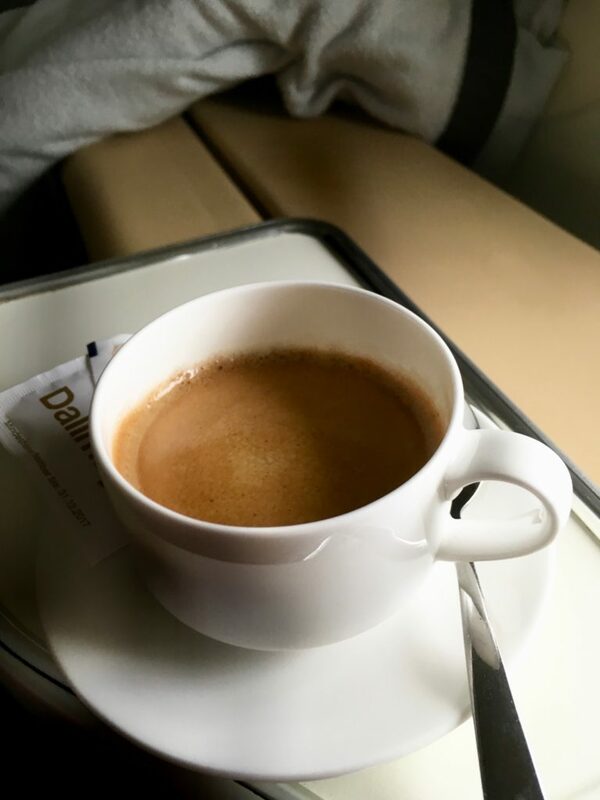 Not much to say here – I think I dozed on and off the whole flight. 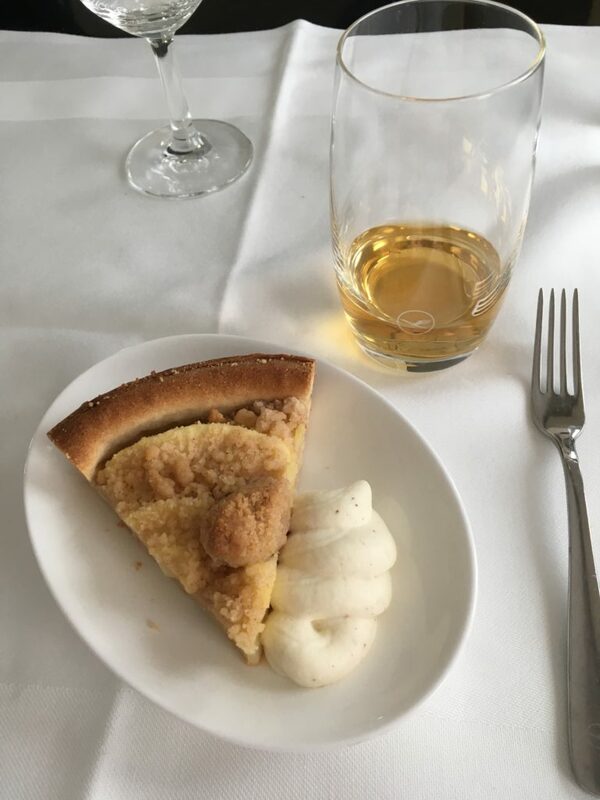 It was a United domestic flight – there’s nothing to get excited about after getting off of Lufthansa first. 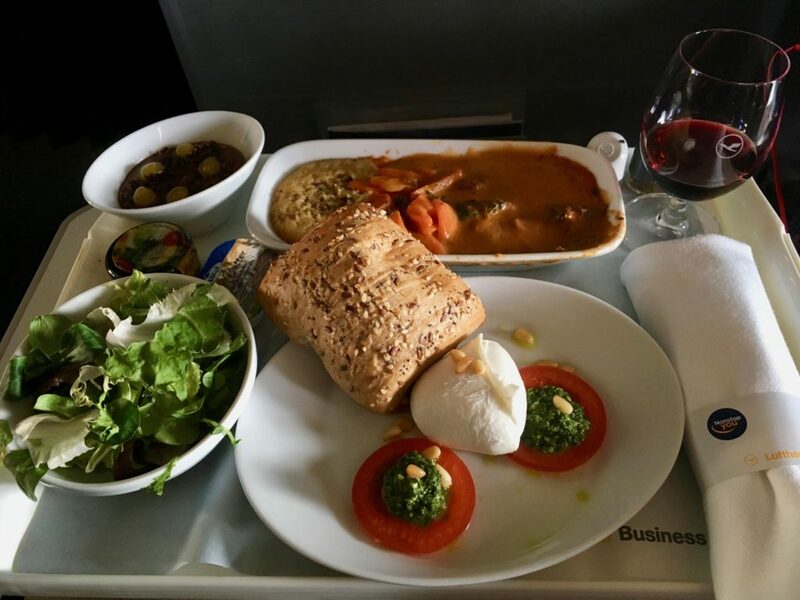 It’s funny how context can really impact things – I’m sure it would have been an exciting and thrilling flight (except for the lack of meal) if it was your first time in domestic first. One of the nice things arriving at Frankfurt in the morning is there’s not such a heaving mass of humanity at immigration. 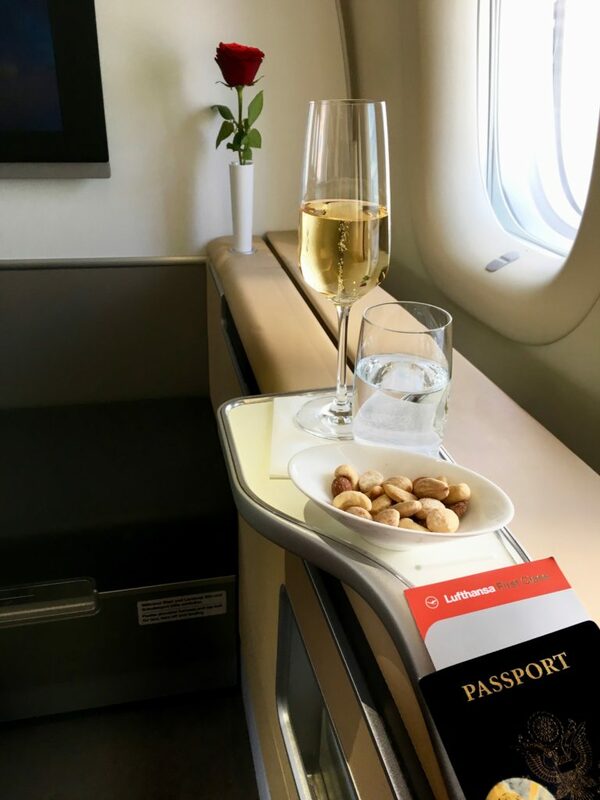 Wait, why was I clearing immigration if I was just connecting between international flights? Well, I had over three hours for my connection, which meant two things: I had time to go to the landside Starbucks (of course!) 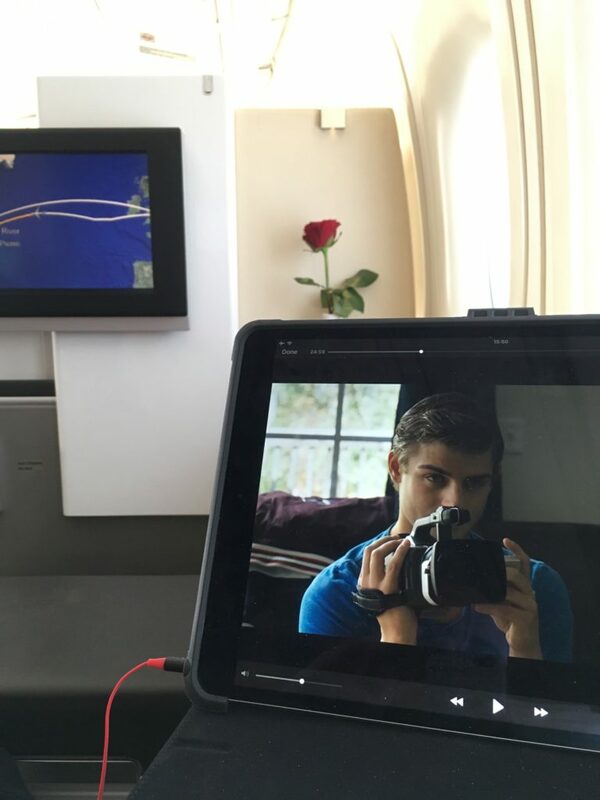 and two: I was finally going to check out the First Class Terminal. 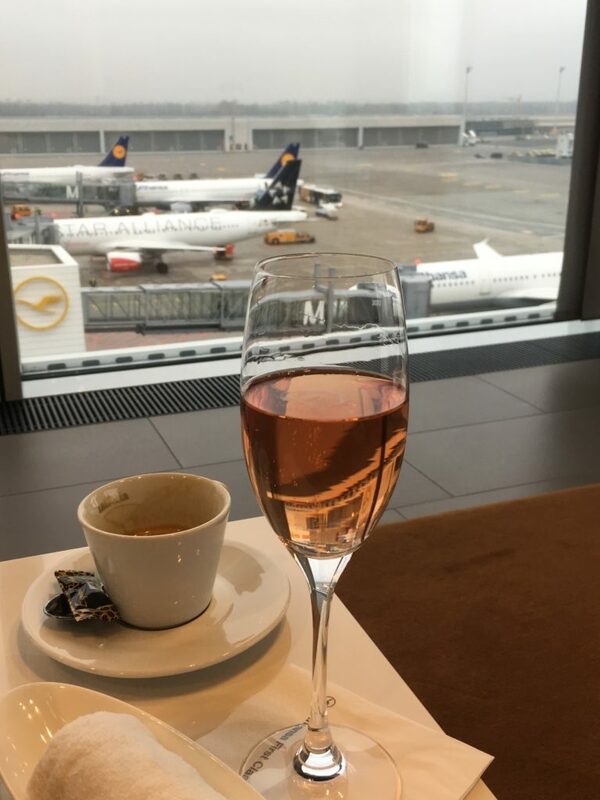 All my other transits of Frankfurt I’ve been content just going to the first class lounge, which honestly has facilities just as nice as the terminal. 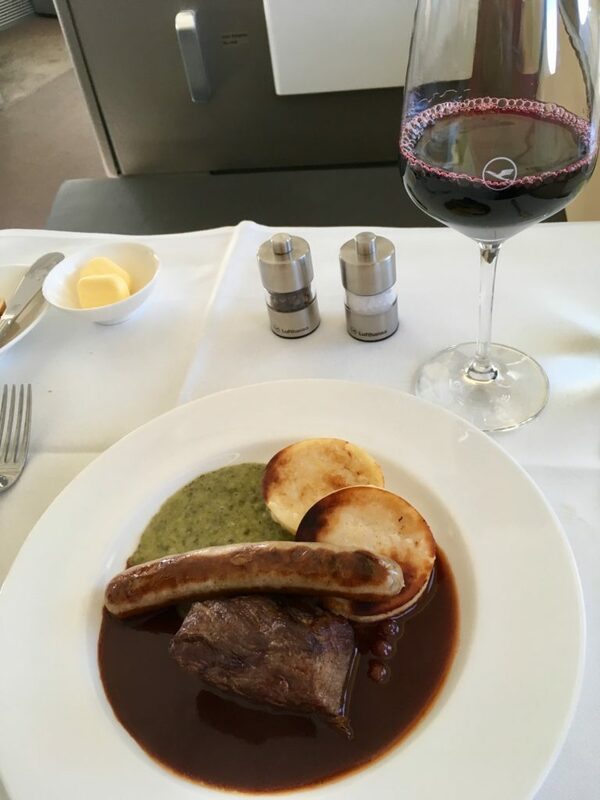 But, the First Class Terminal is something special that only Frankfurt does, and I figured I should finally do it. 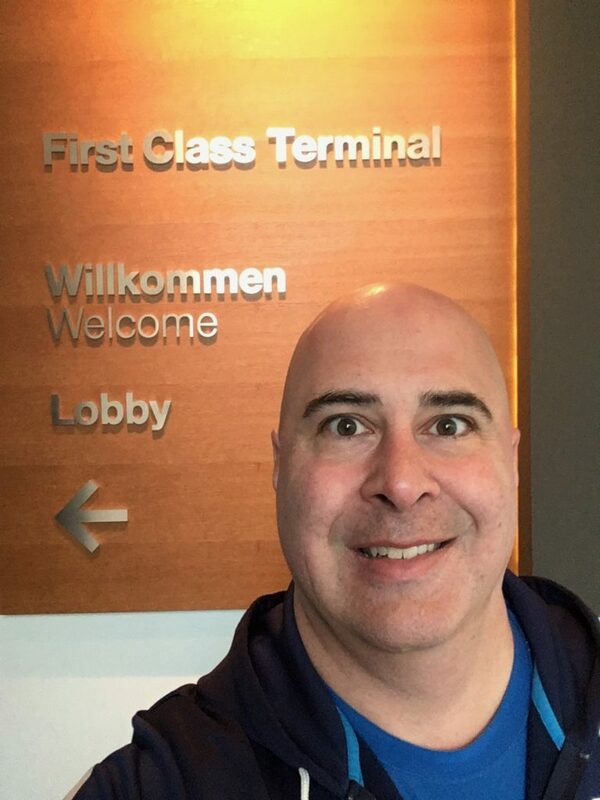 After grabbing Starbucks, I headed downstairs from the check-in level (key point here), out the front of the terminal, walked left for 5-10 minutes, and I was at the elevator to head into the terminal. 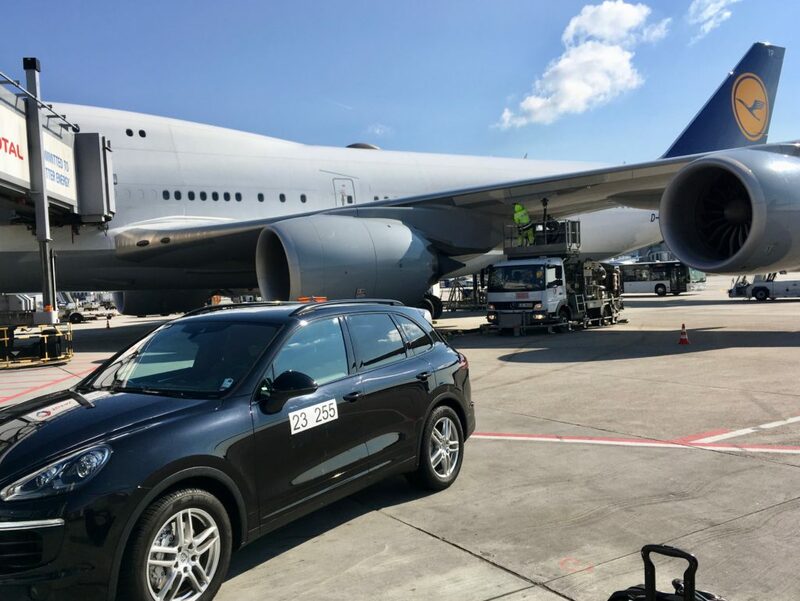 I think they’re more used to people driving to the terminal (since it really is meant to be a Frankfurt-origin terminal) but no problem at all. 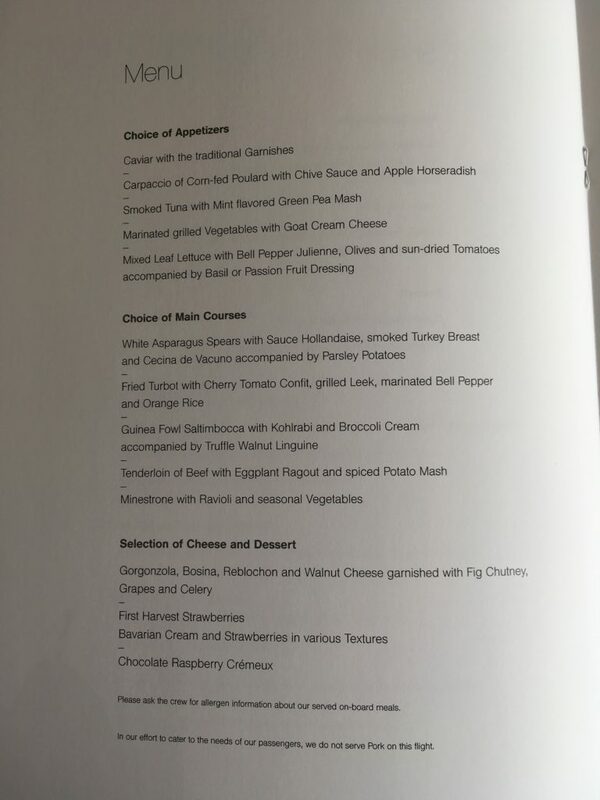 Grabbed a quick shower, and asked the attendants if they could arrange any of the UEFA special edition rubber duckies. No problem, she would search for them while I was showering. As usual, the lounge was heated to a temperature somewhere between roasting and blazing hot, and even a good 15 minute cool shower didn’t help too much. 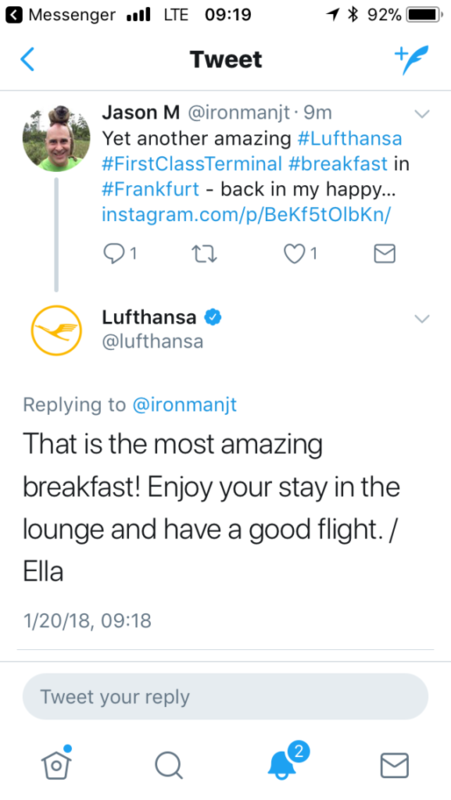 Oh well, the biggest downside of Lufthansa in my book. 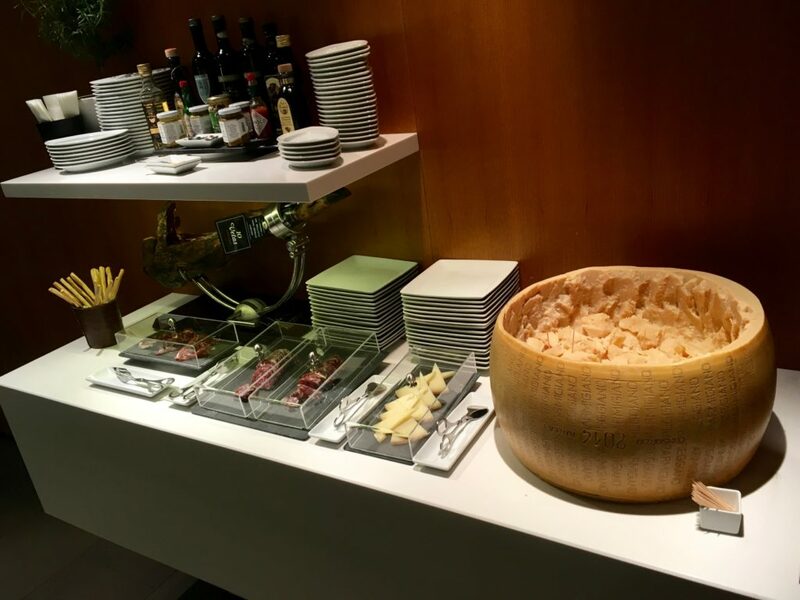 Look at the size of that cheese wheel on the buffet…it’s like they knew I was coming! 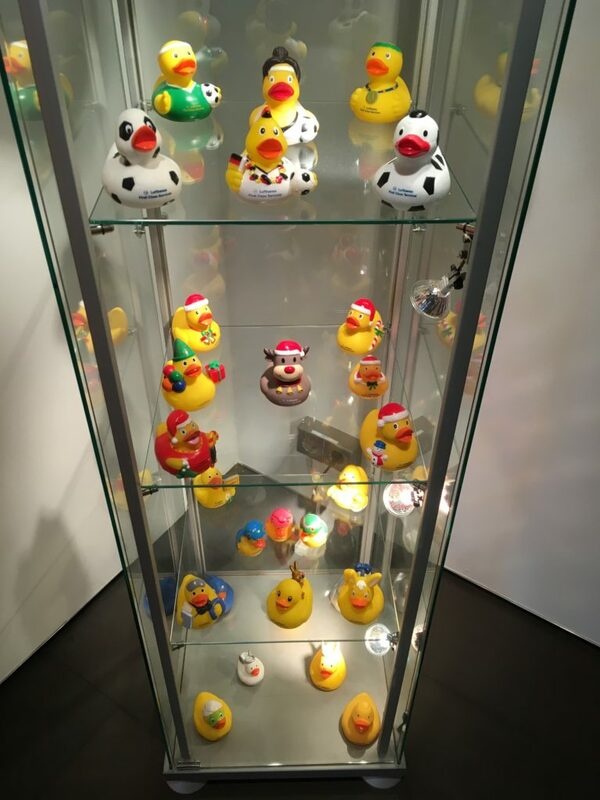 There was a glass case in the lounge showing many of the limited edition ducks they’ve given away over the years. Just wish I had more of them. A bit of polite begging and I was able to get a couple extra UEFA ones, so if anyone out there is interested in a trade…. 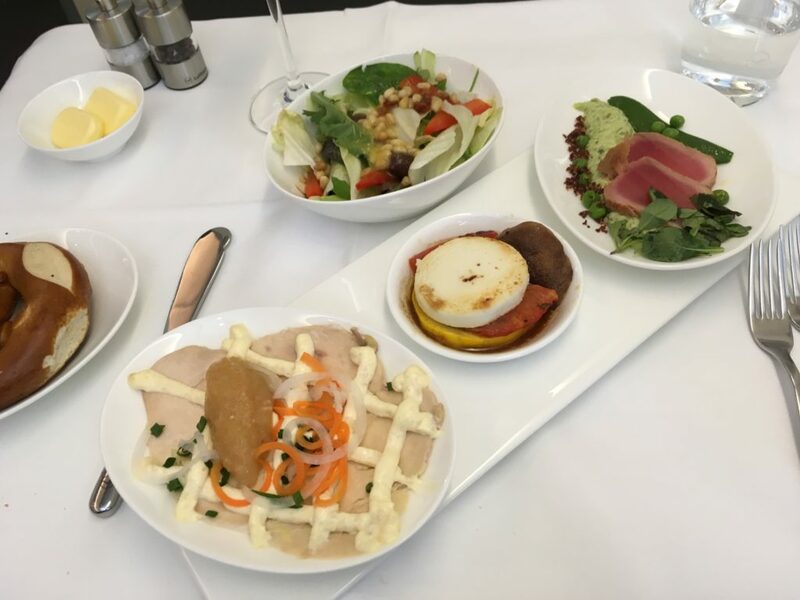 All three appetizers and salad. The only one I was really a fan of was the tuna. The grilled vegetables and goat cheese was also decent, but I wasn’t a big fan of the other one. 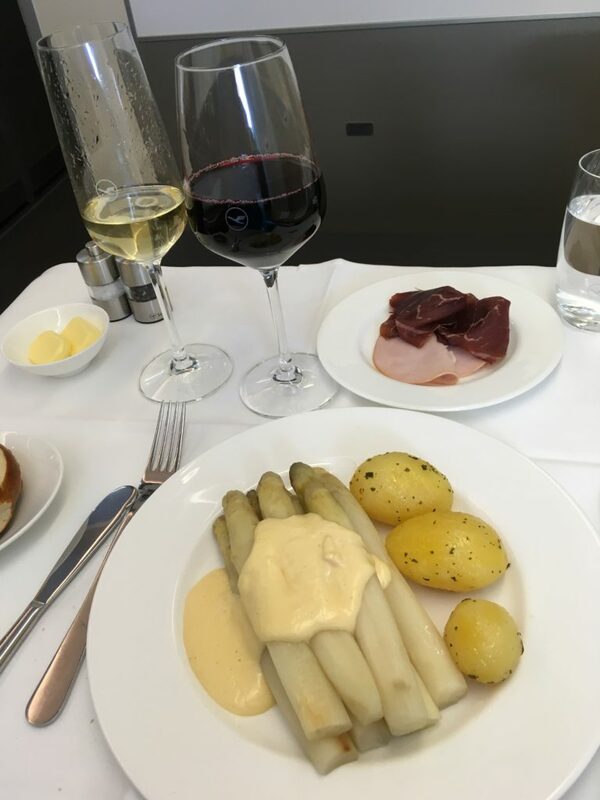 This is where it got interesting…I decided since it’s Spargelsaison, which is apparently a big deal in Germany, I went with the asparagus entree, and it was absolutely delicious. The sauce really made the dish, and there were some smoked meats served on the side to ensure the carnivore inside you stayed happy. 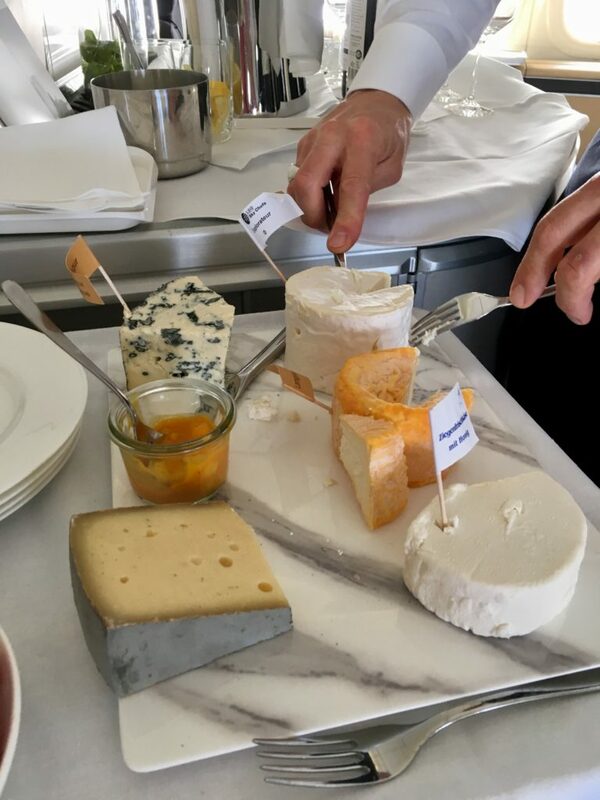 I was getting seriously full by this point, but I had to try the cheese…in the name of science. 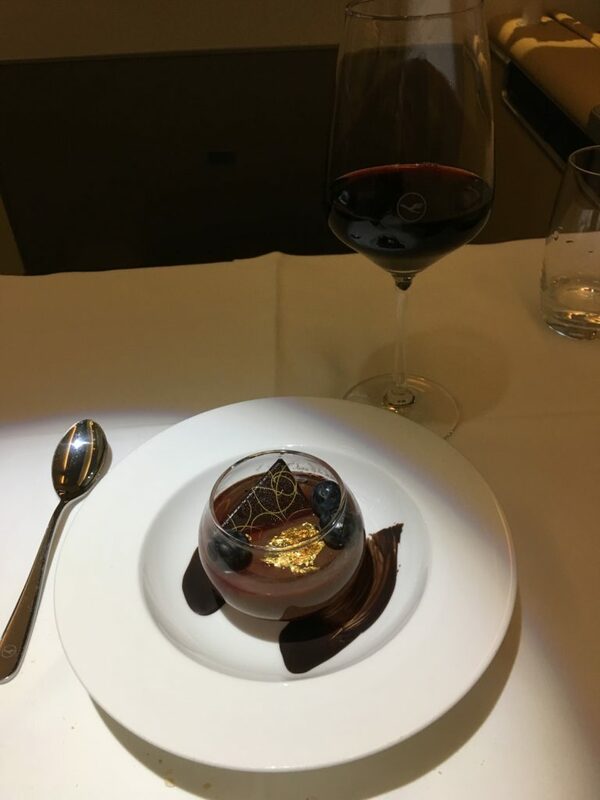 …and finally the chocolate dessert which was absolutely fantastic and worth the splurge. It also paired really nicely with the wine I was drinking. Thankfully I was already way past full, or there might have been a second. 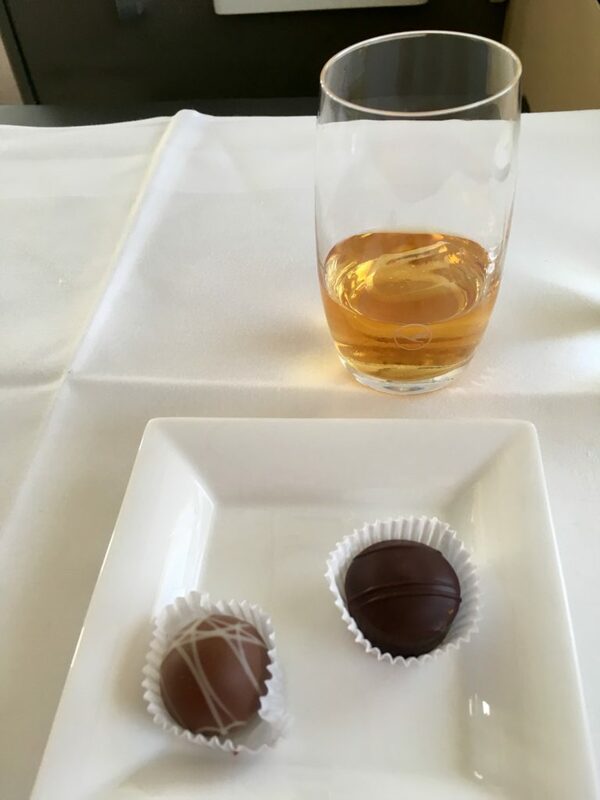 That didn’t stop me from a couple chocolates and a glass of Johnny Walker Blue. …at which point I passed out. For another three hours. That was the end of the flight. 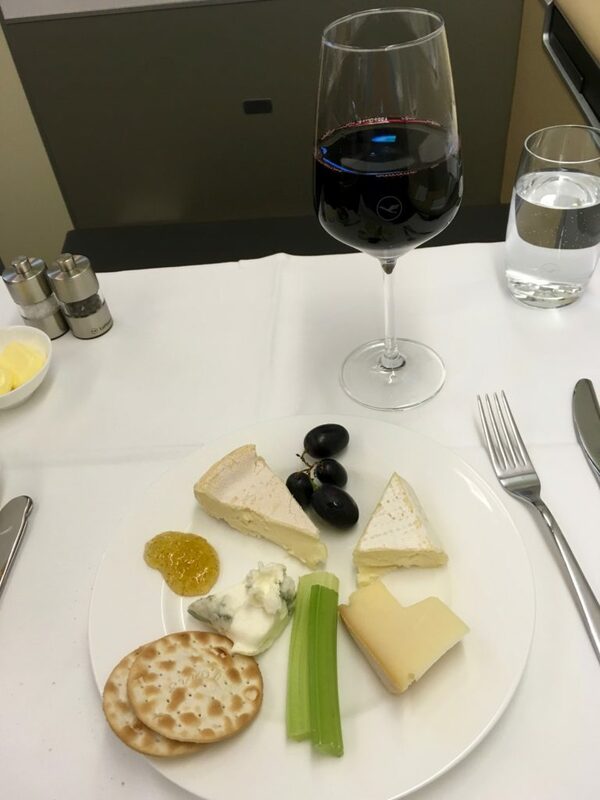 Unfortunately I can’t report back on the snacks that were on offer because I slept right through it, but clearly I hadn’t sleep quick enough on the previous flight. 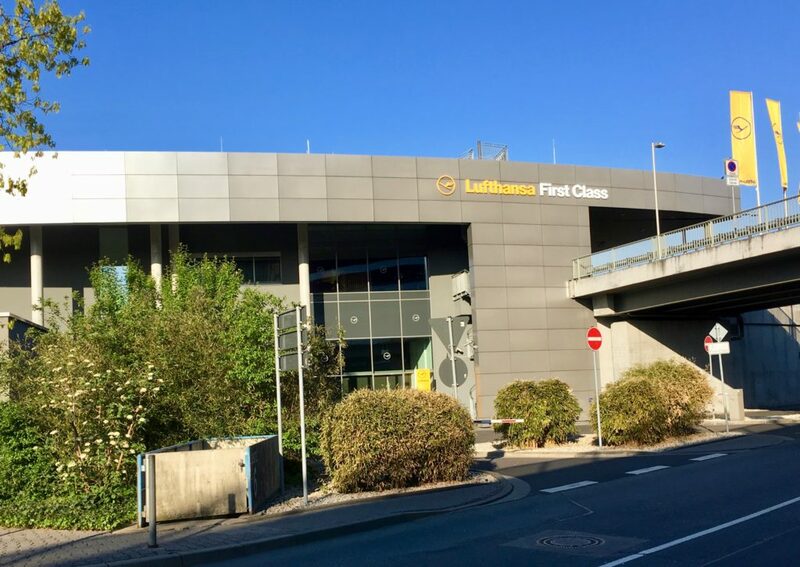 Another extremely solid Lufthansa First experience in the books – and even better – it’s now been several flights since they turned it up to sauna temperatures. 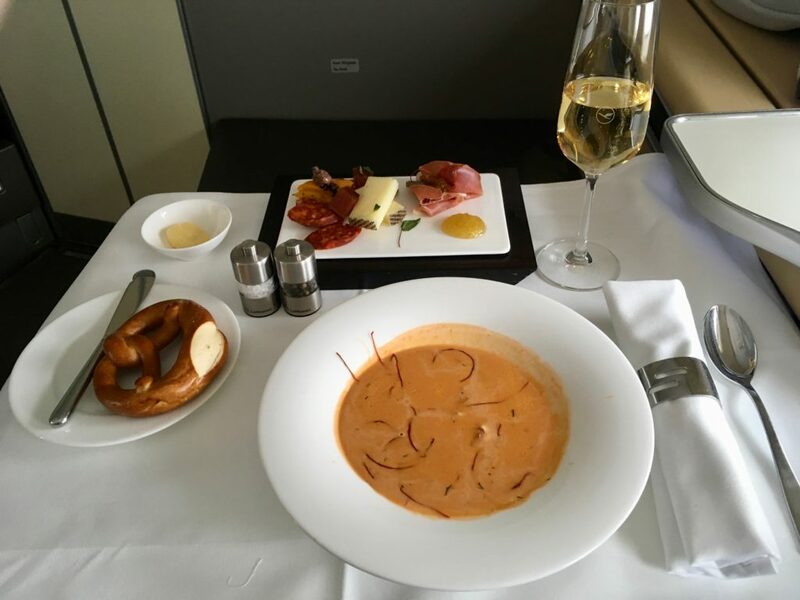 Maybe Lufthansa finally has lowered their in flight temperature protocols. 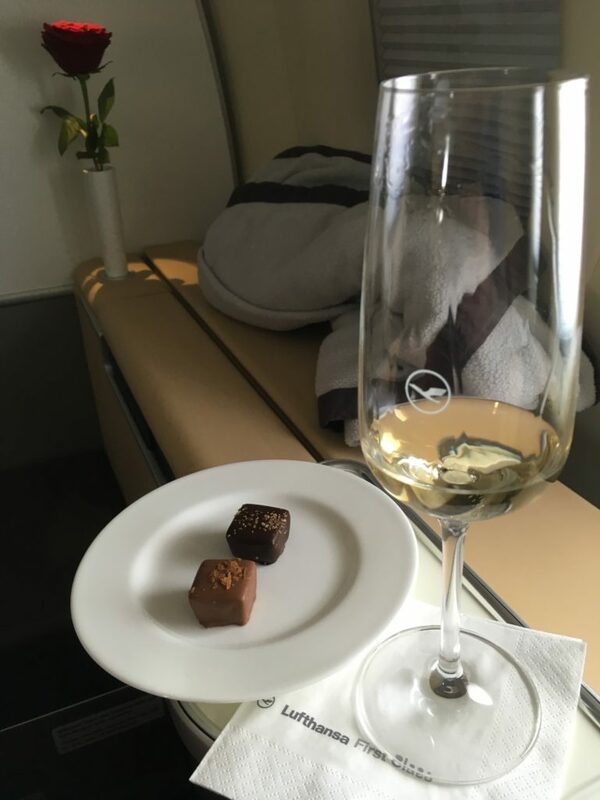 I’m definitely going to miss flying Lufthansa first in the immediate future, but after this trip report is done I think I’m going to do a comparison of first class products. 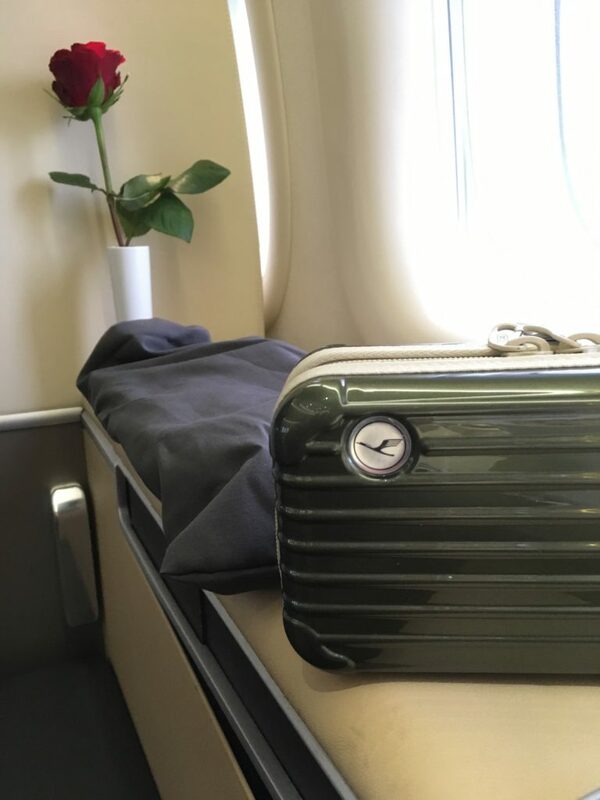 Although Lufthansa isn’t perfect (especially on privacy of the seats) they do as good of overall job as anyone! Next up, off to the hotel for a rather short night in Dubai, and then on to Turkmenistan!